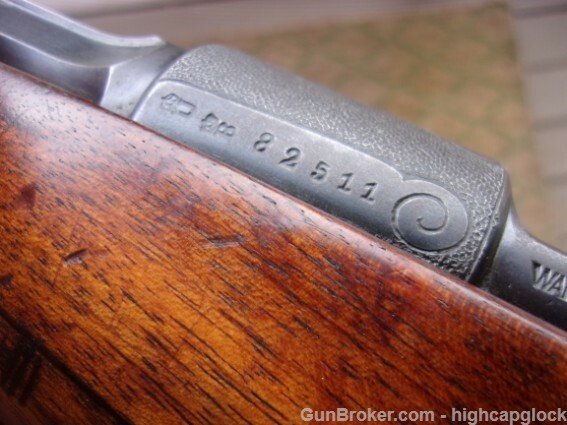 I was bidding on that one too but the price got out of hand for me. 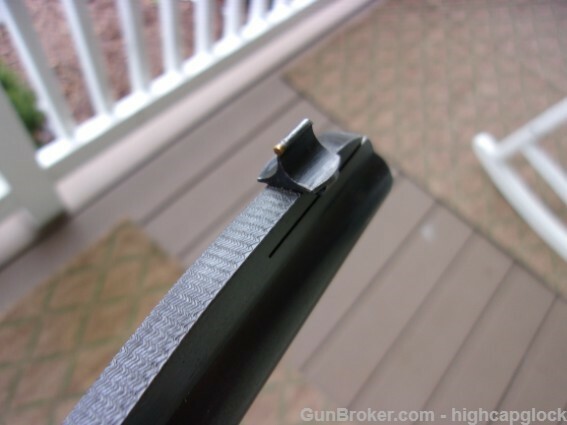 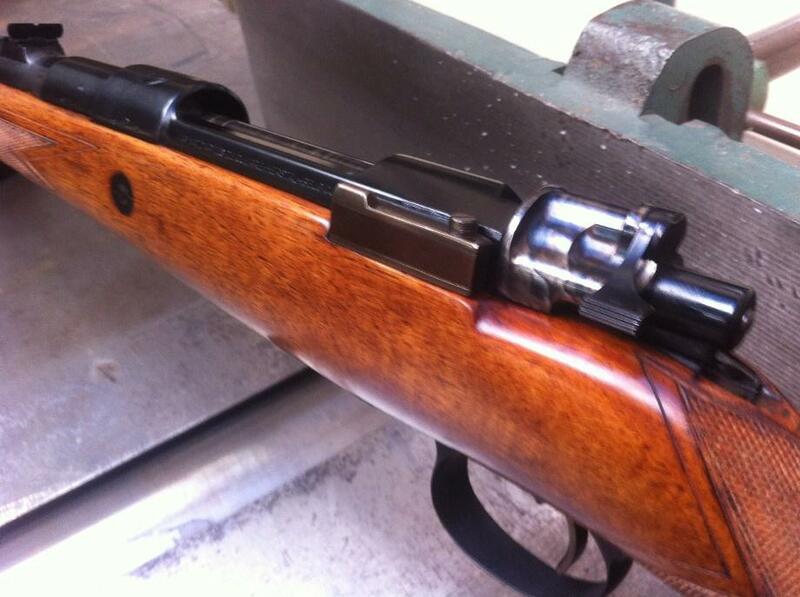 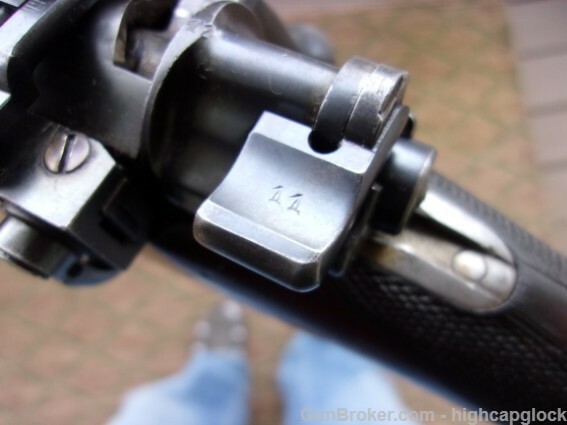 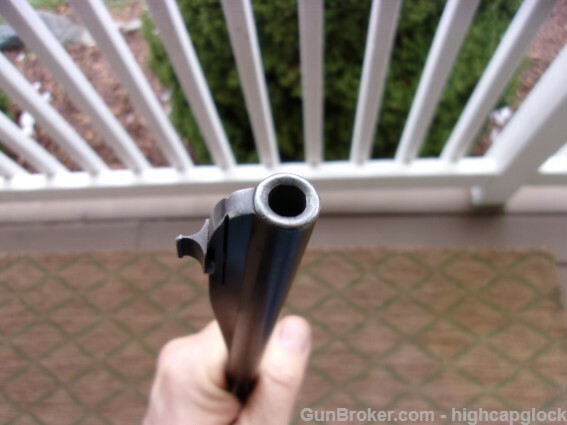 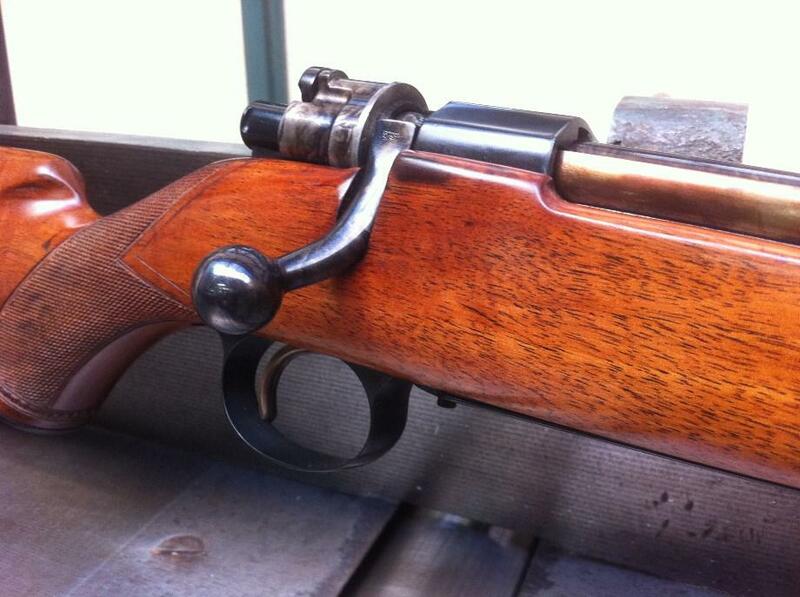 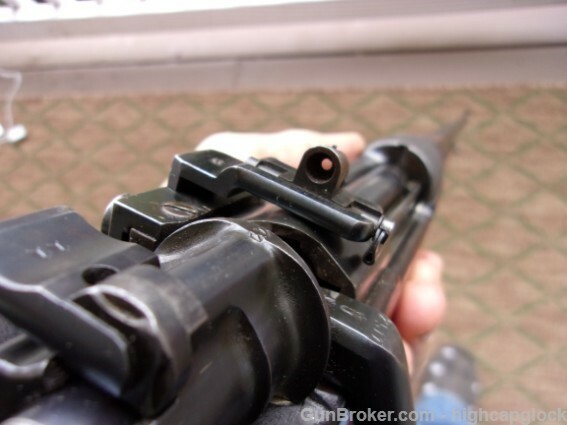 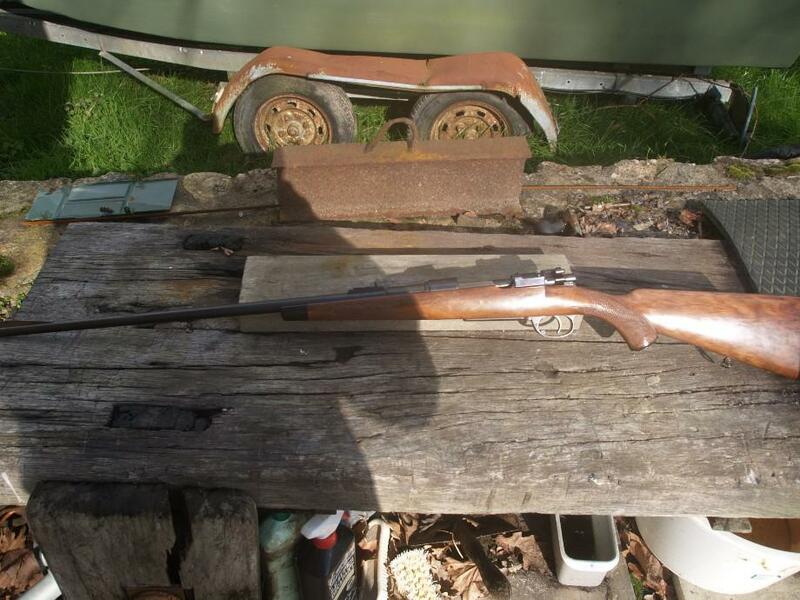 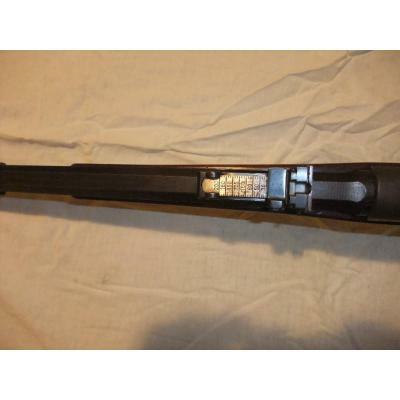 There looks to be major rust pitting on the bolt shroud and even worse on the front sight and barrel. 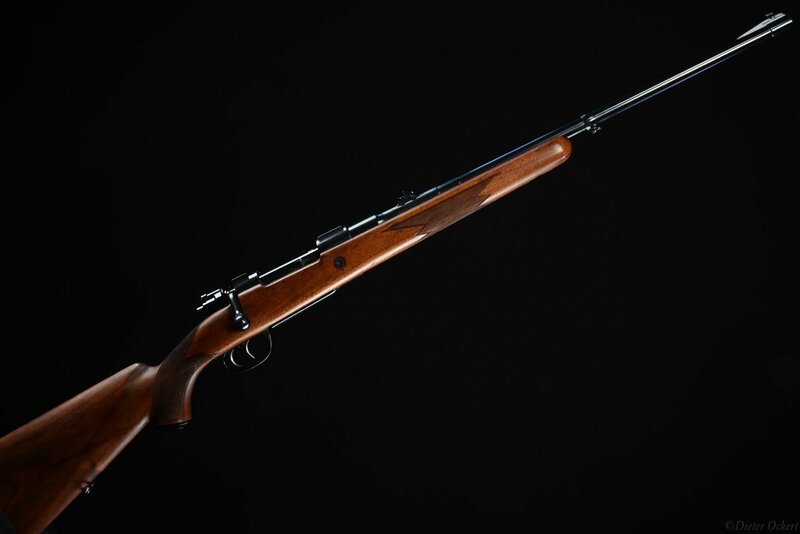 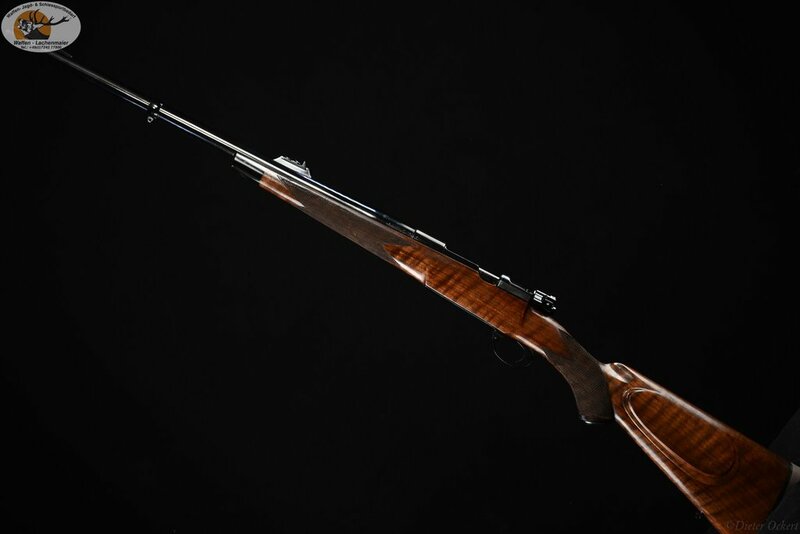 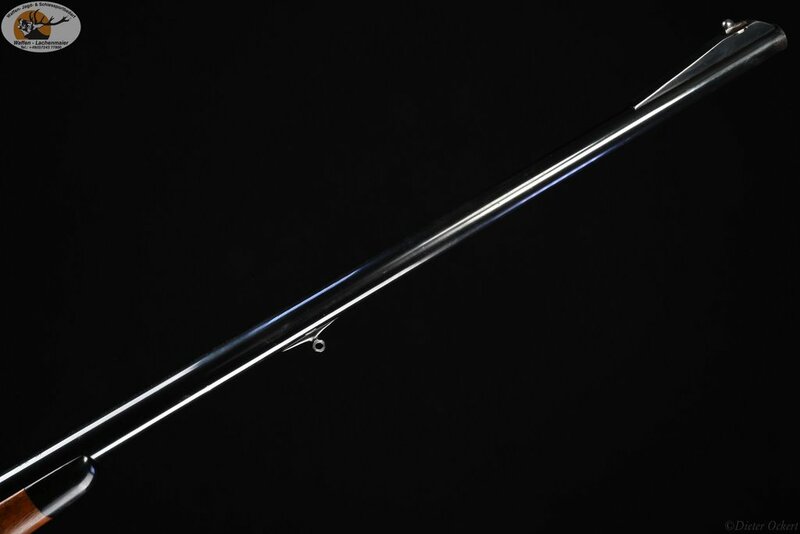 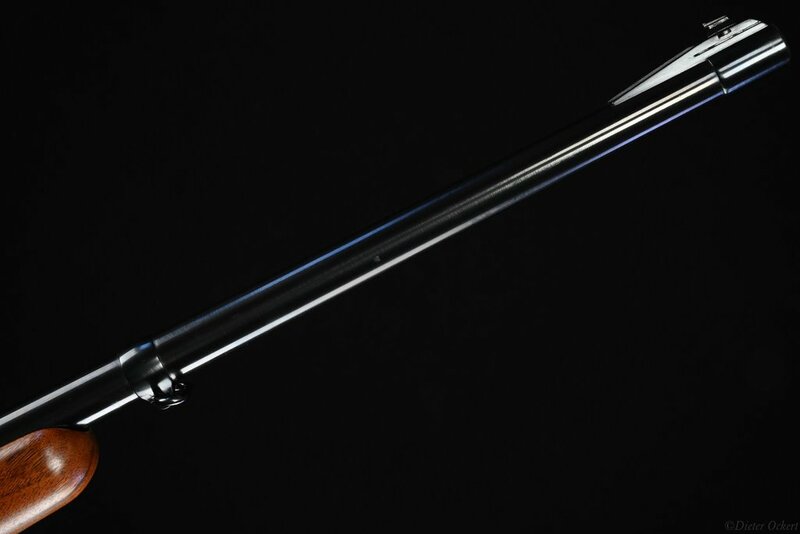 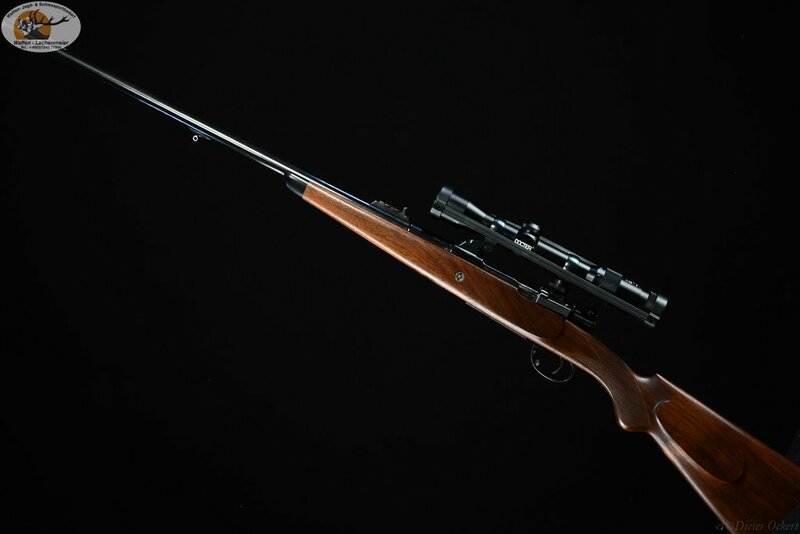 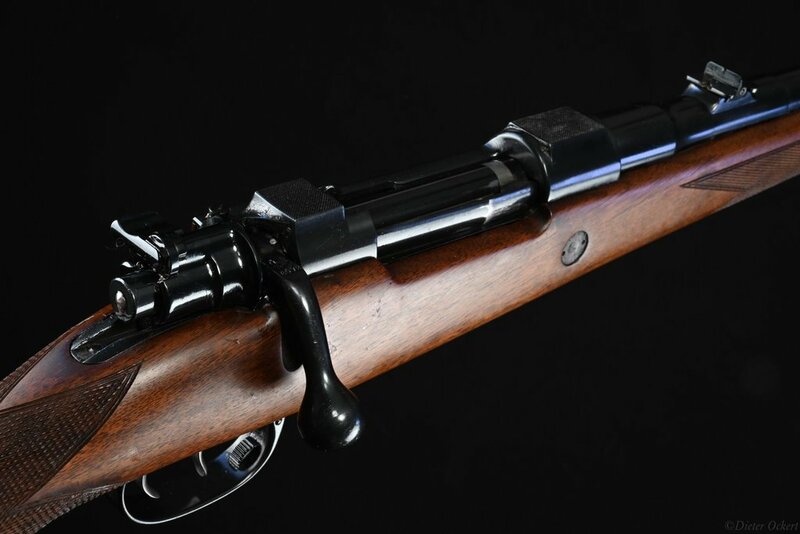 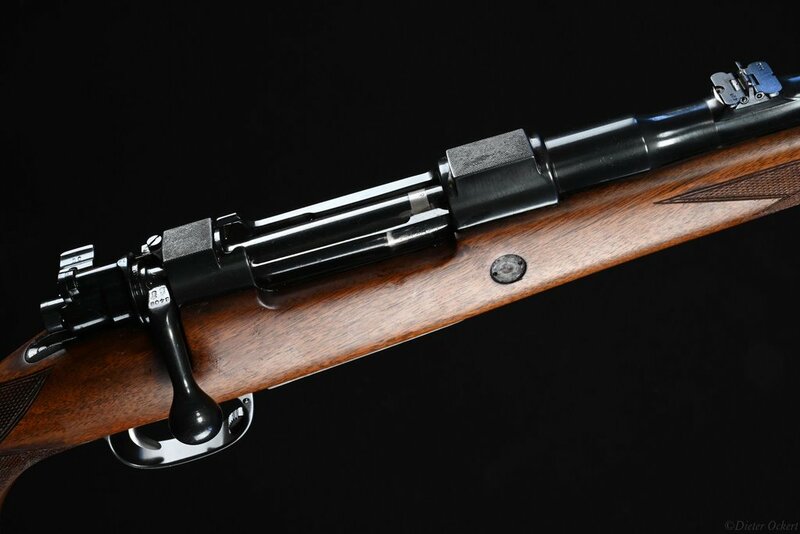 It is a very special rifle, but putting it right would have been a major project. 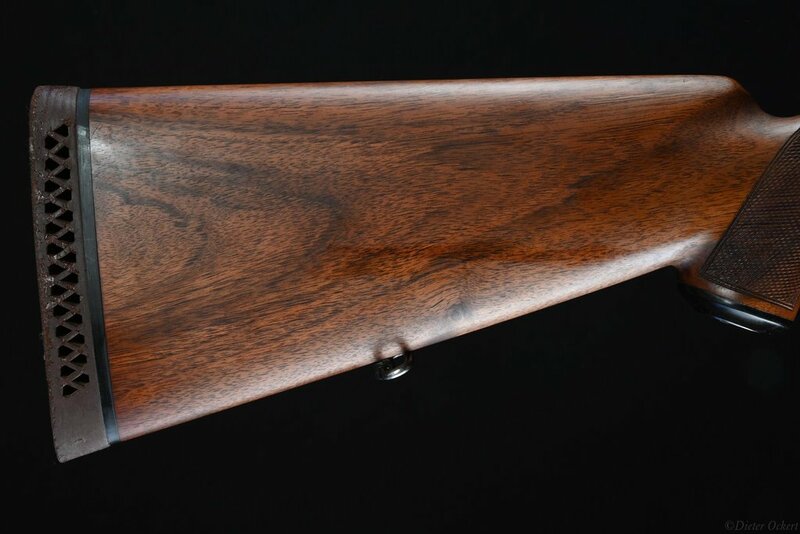 Perhaps it went to the floor where somebody got a really good look at the bore and overall condition and felt it was worth the effort. 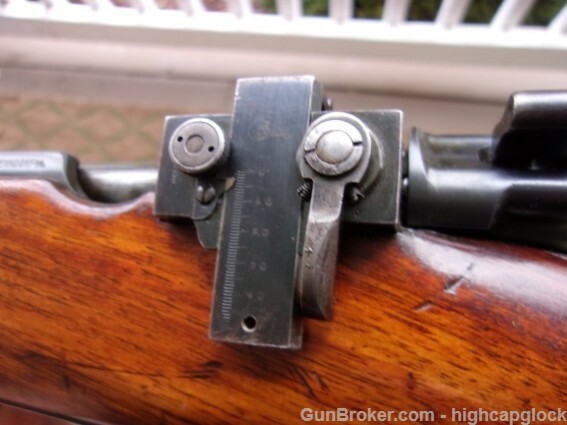 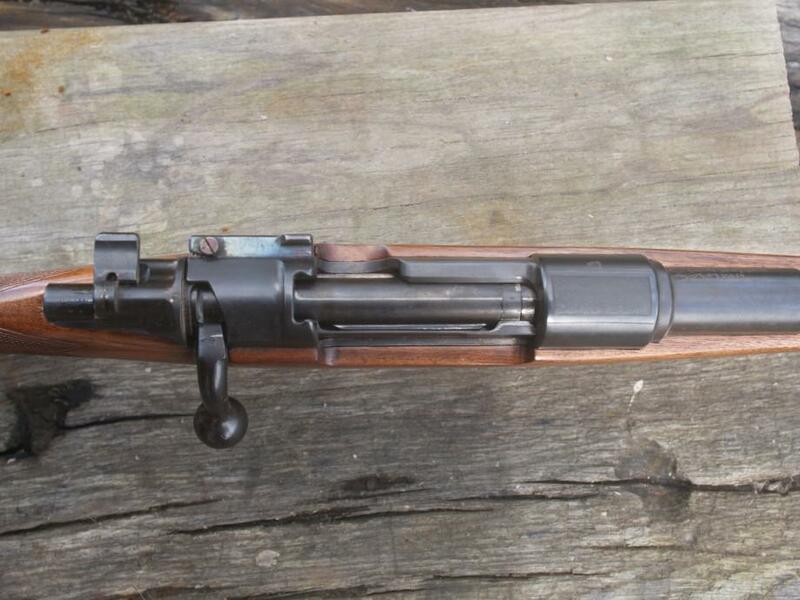 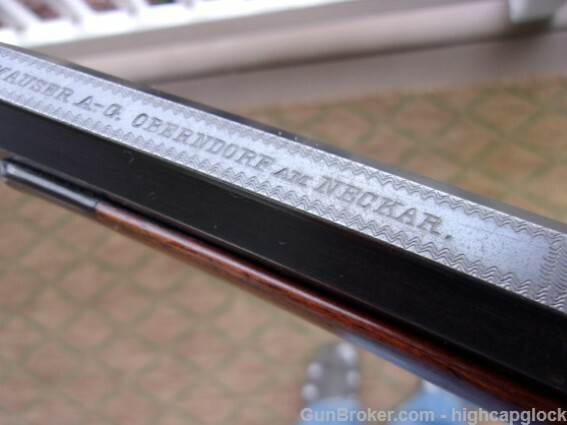 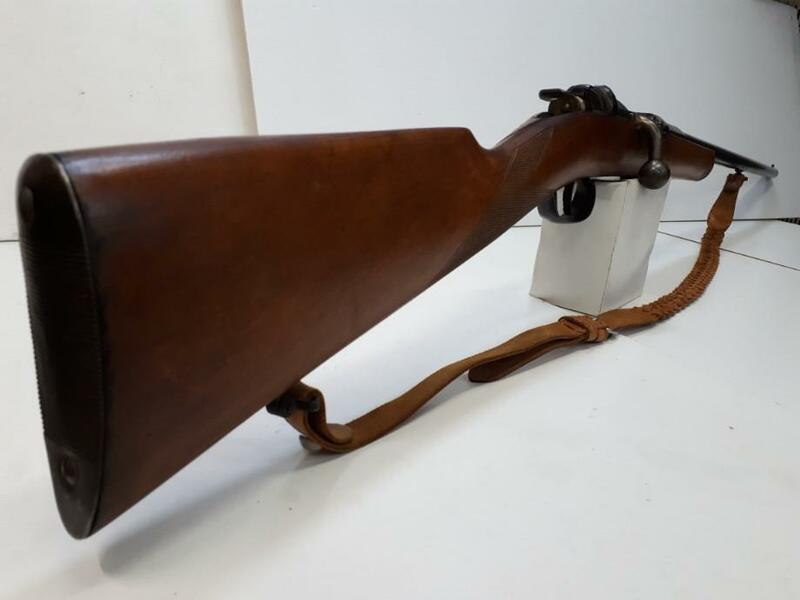 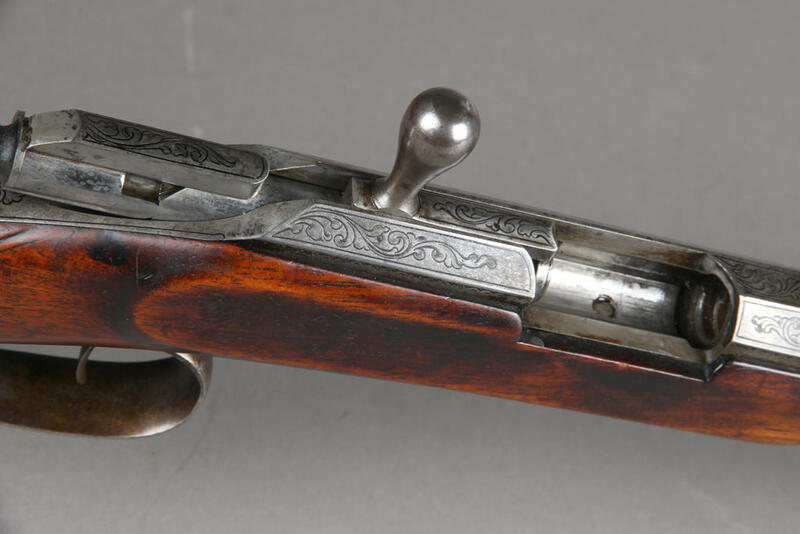 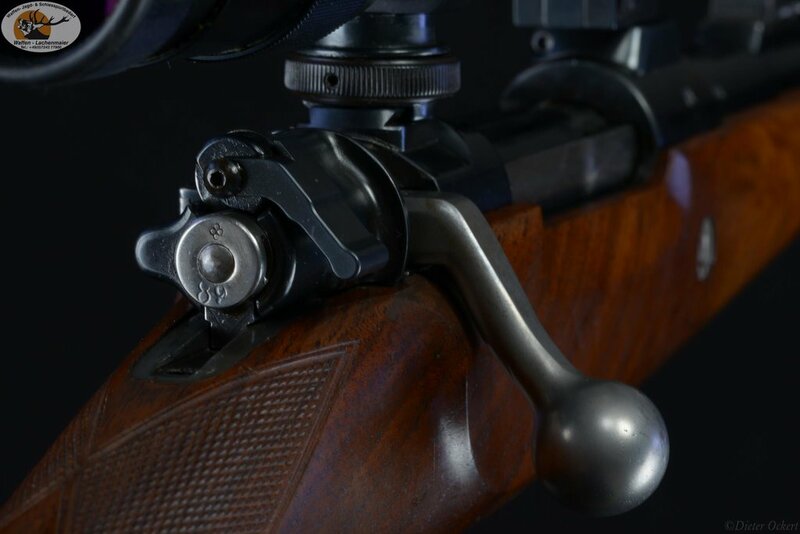 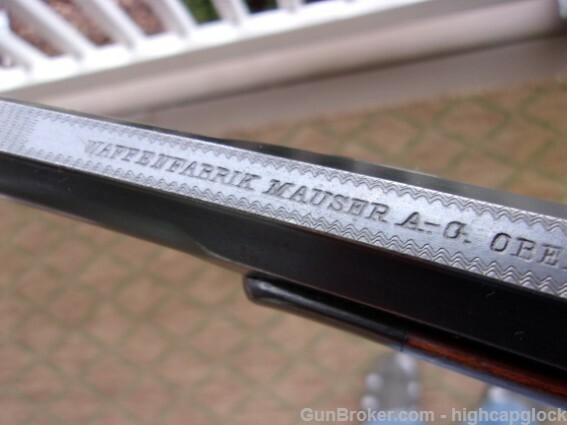 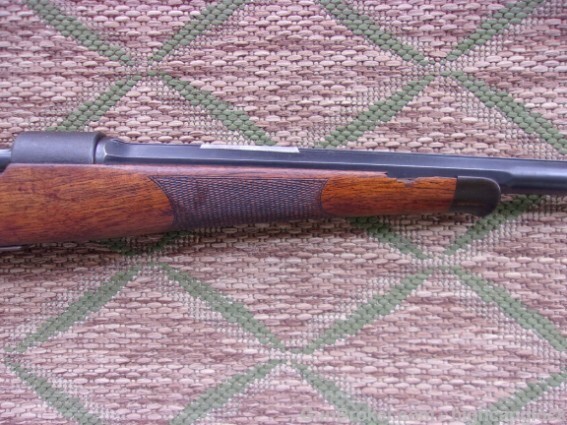 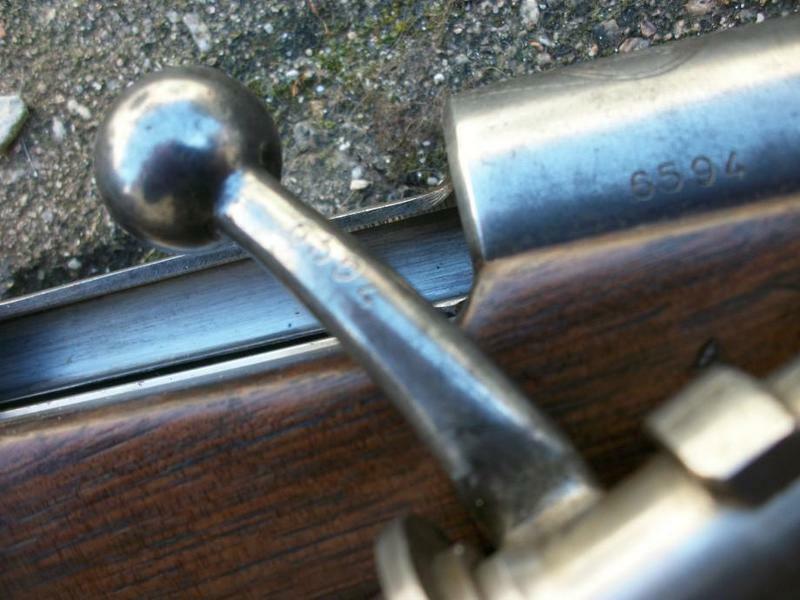 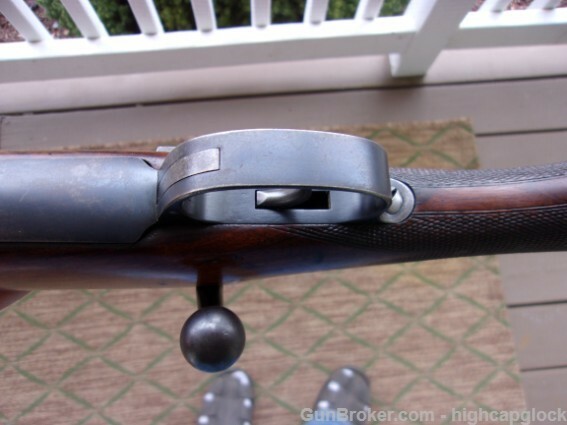 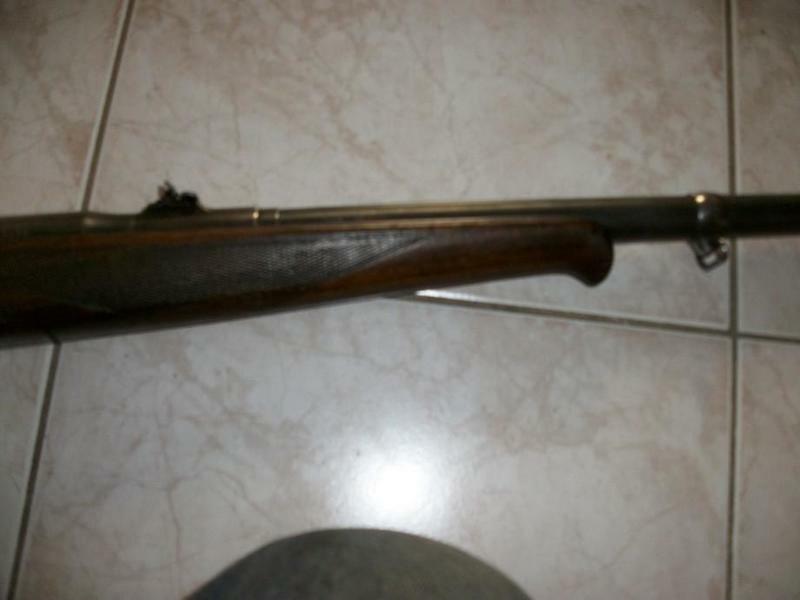 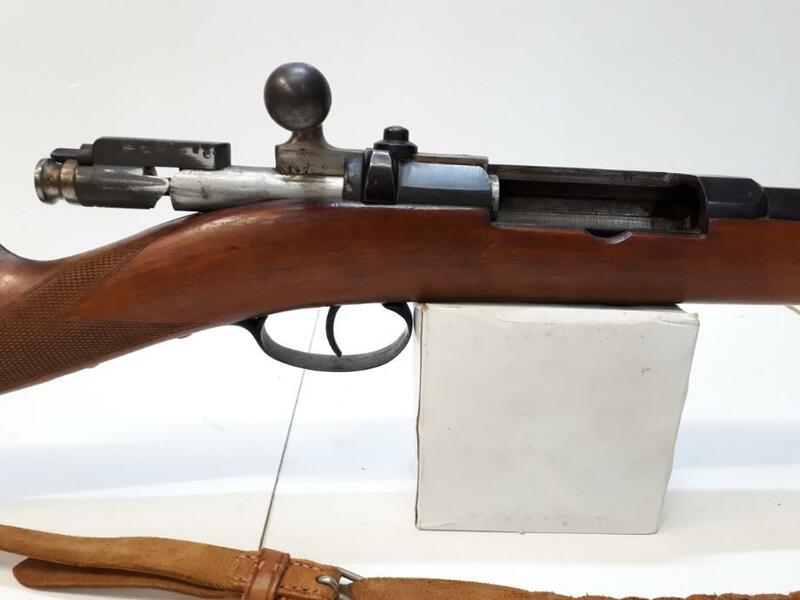 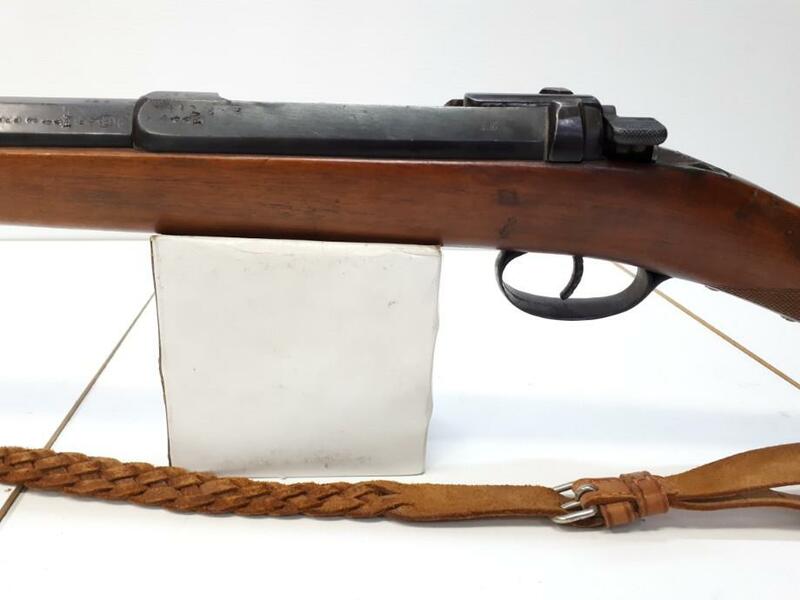 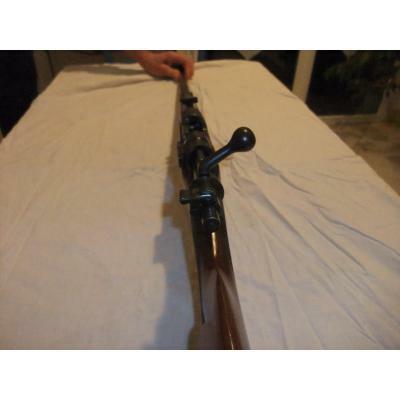 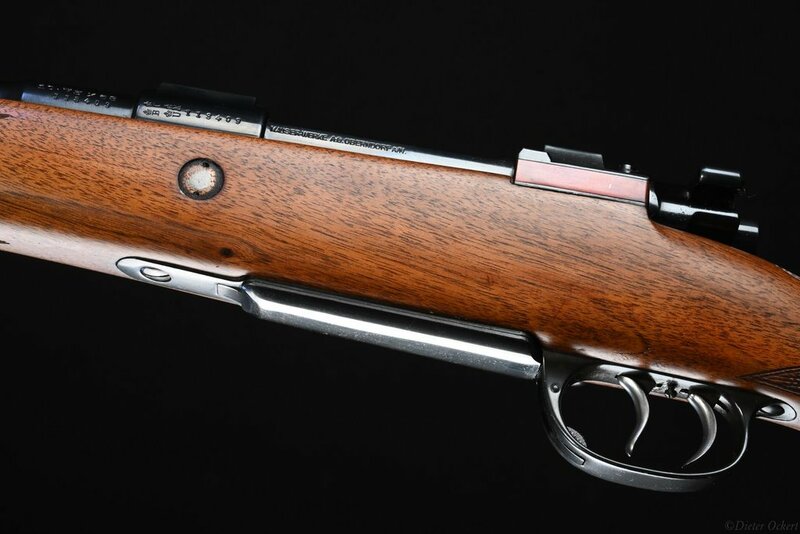 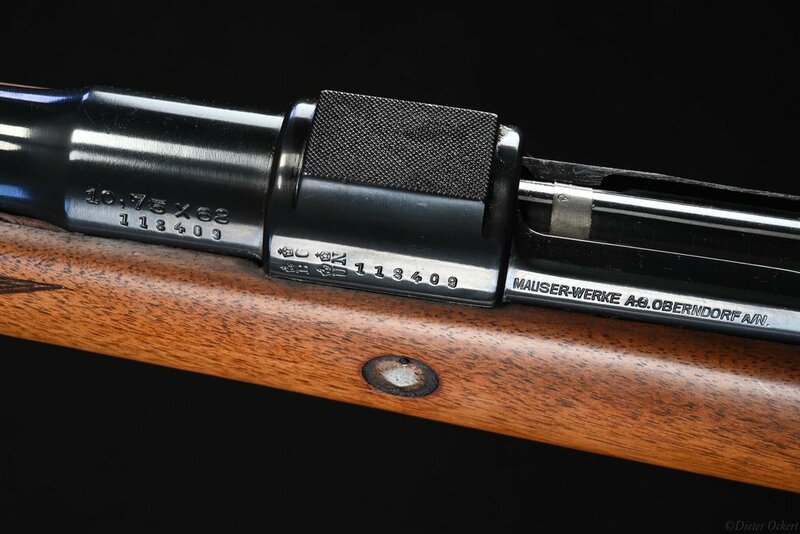 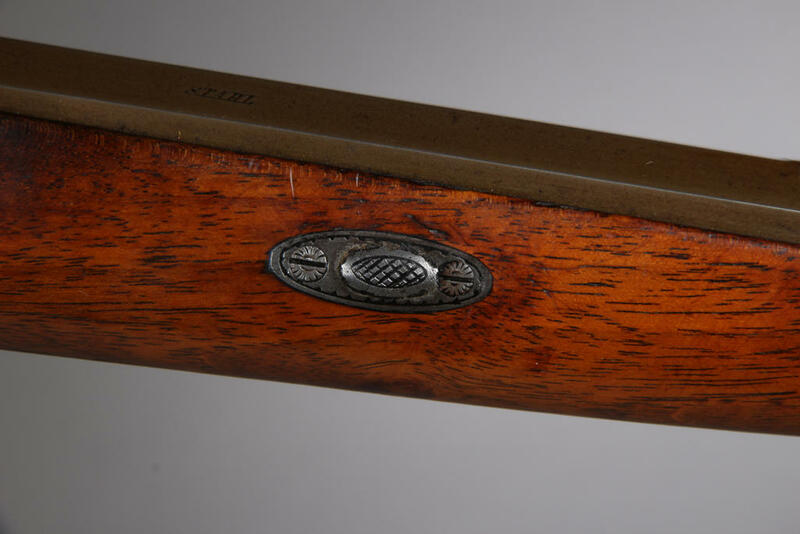 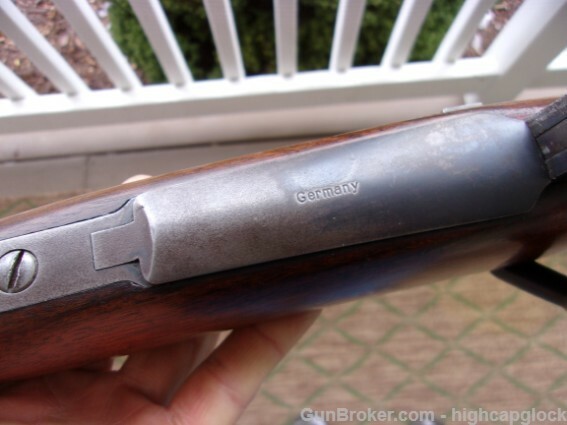 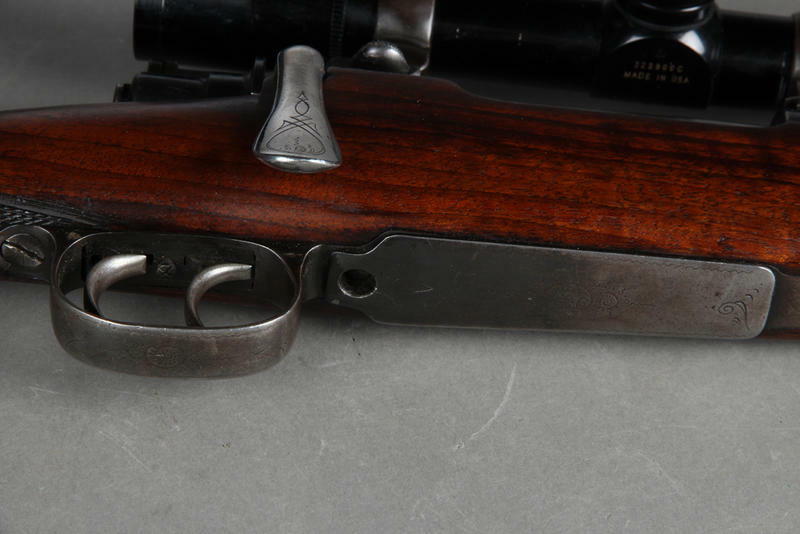 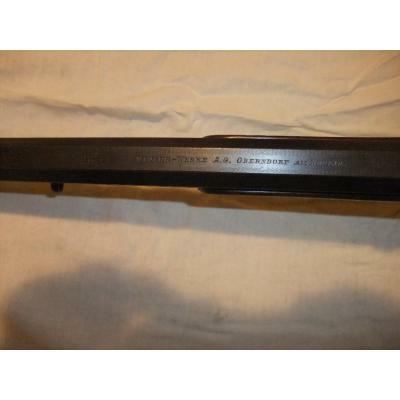 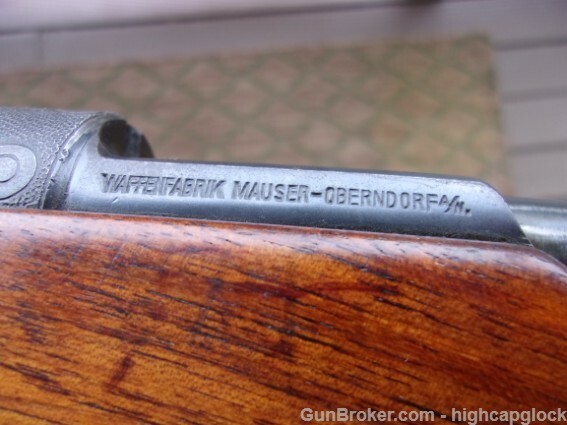 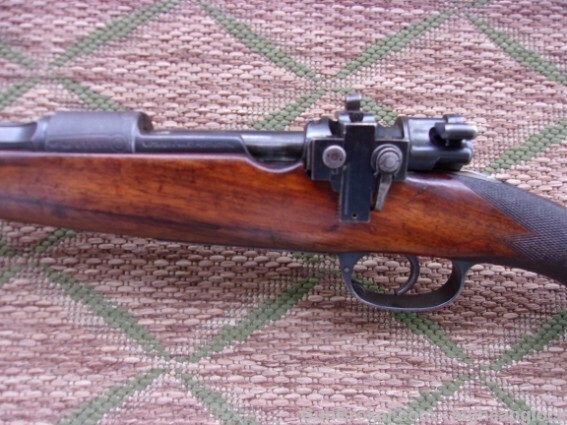 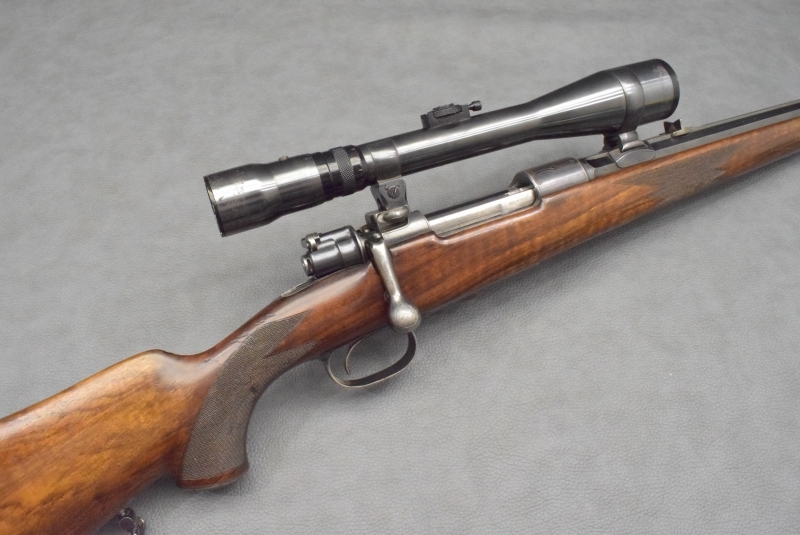 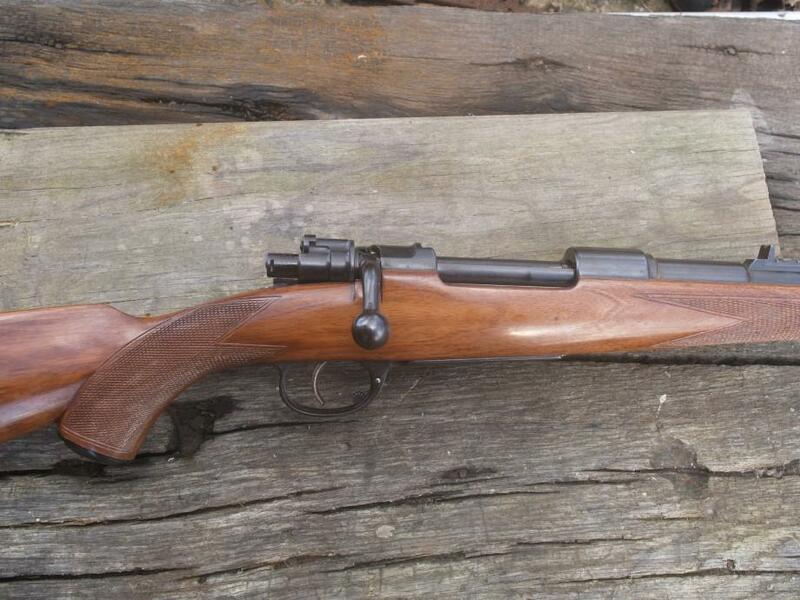 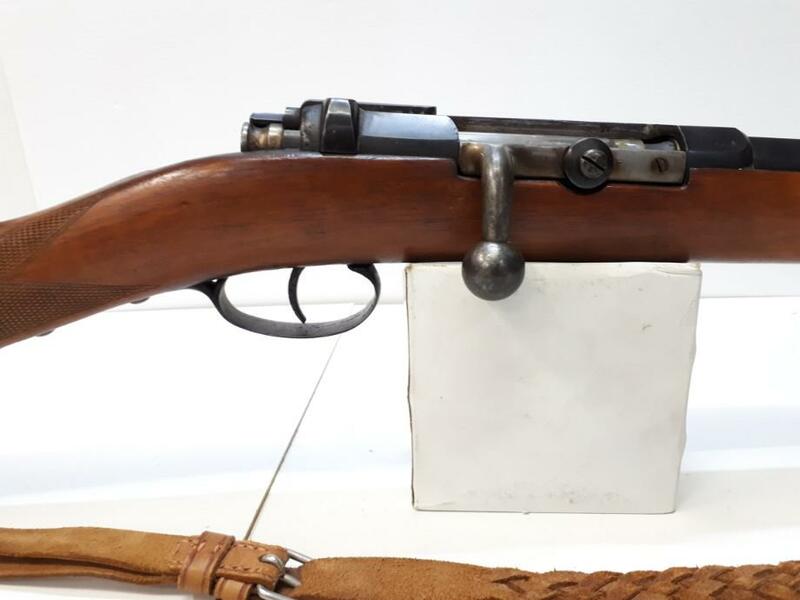 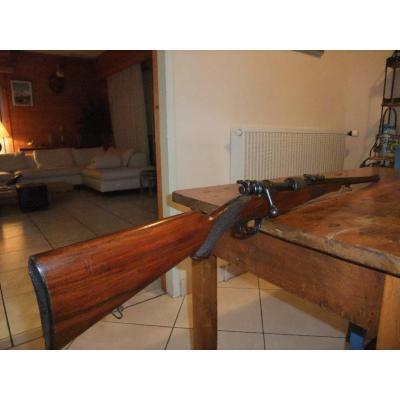 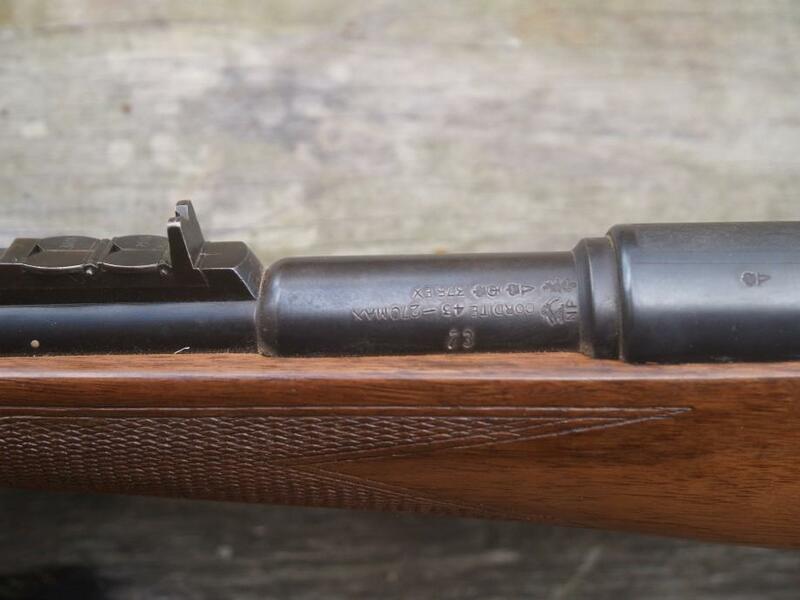 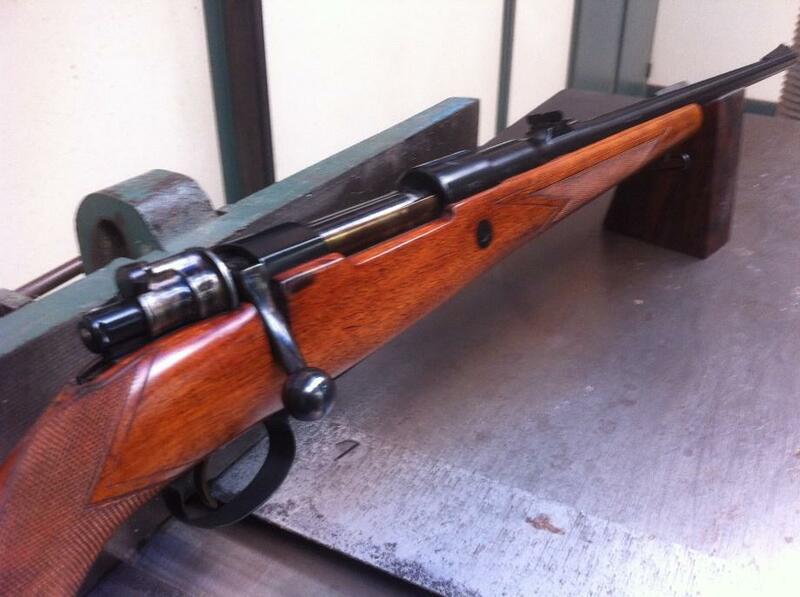 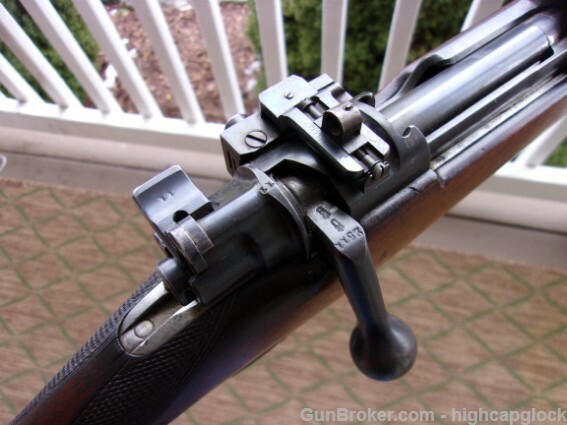 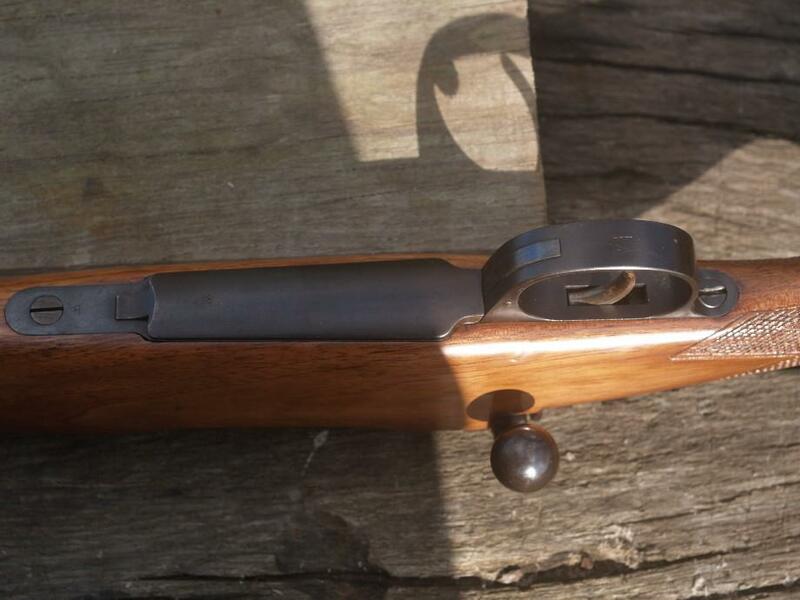 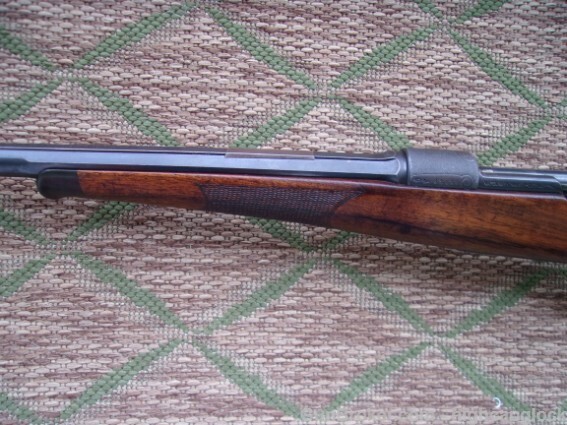 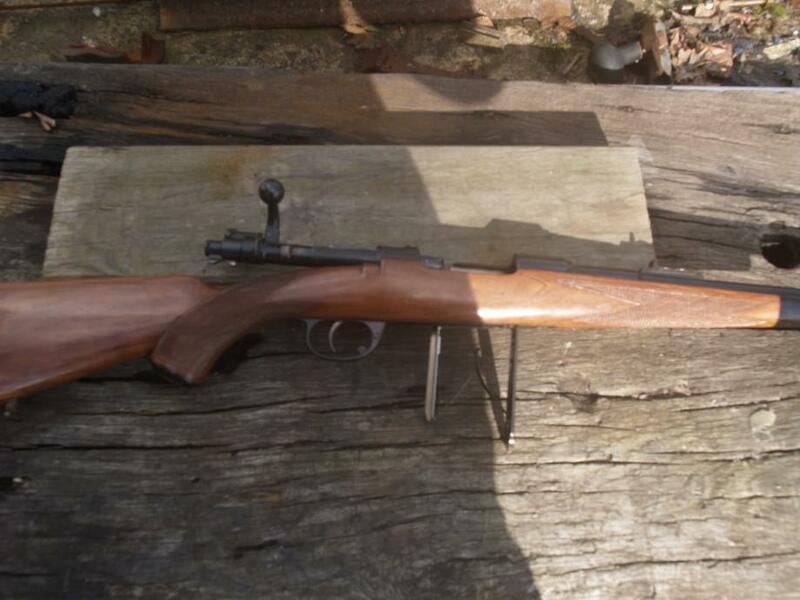 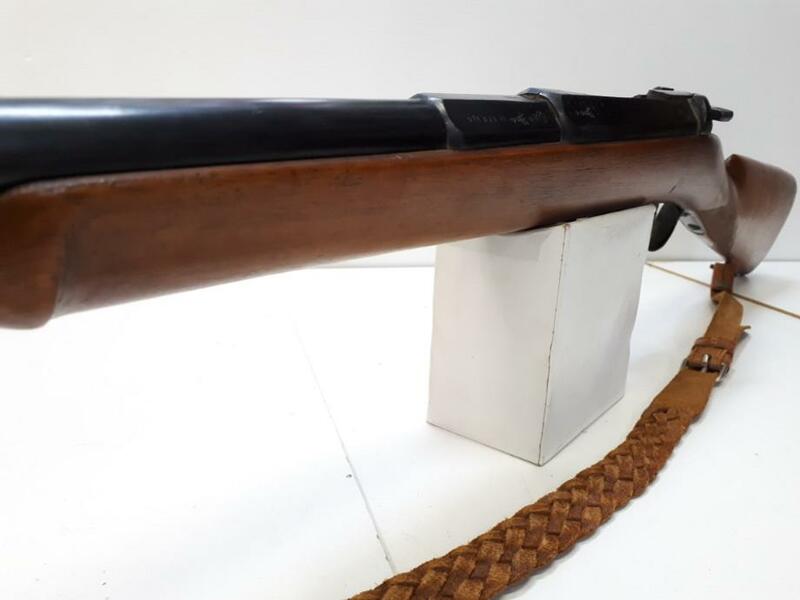 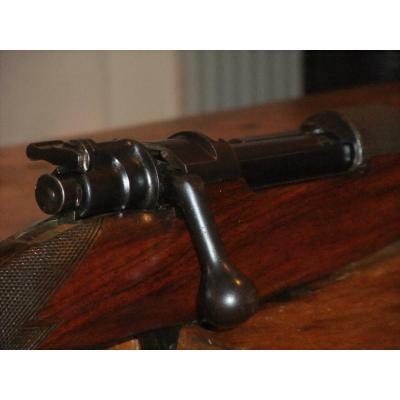 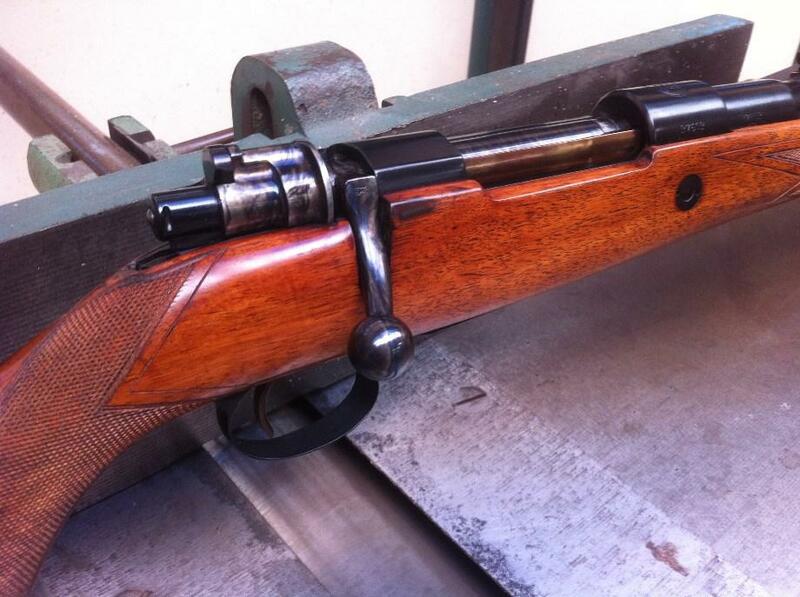 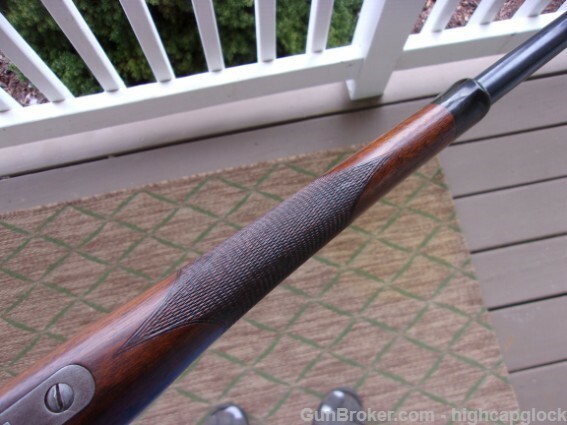 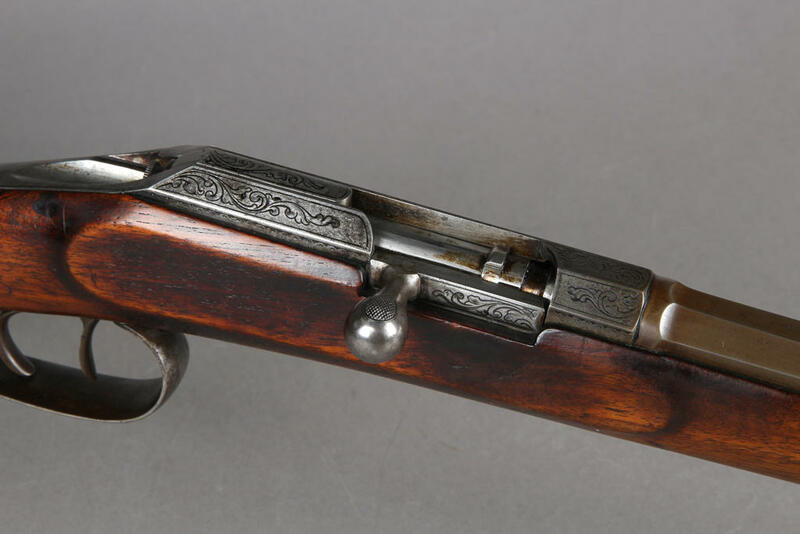 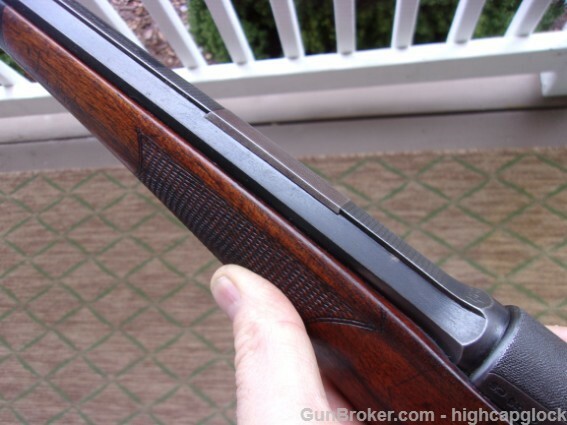 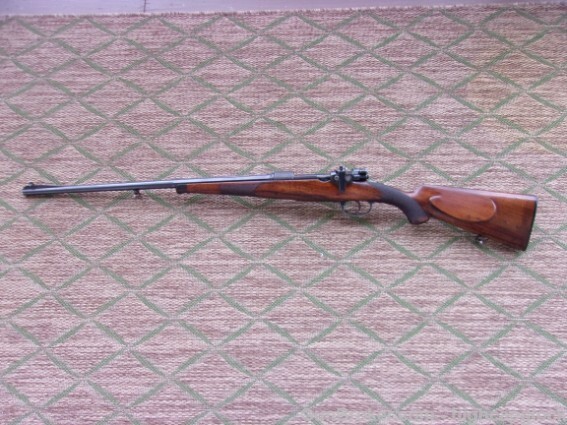 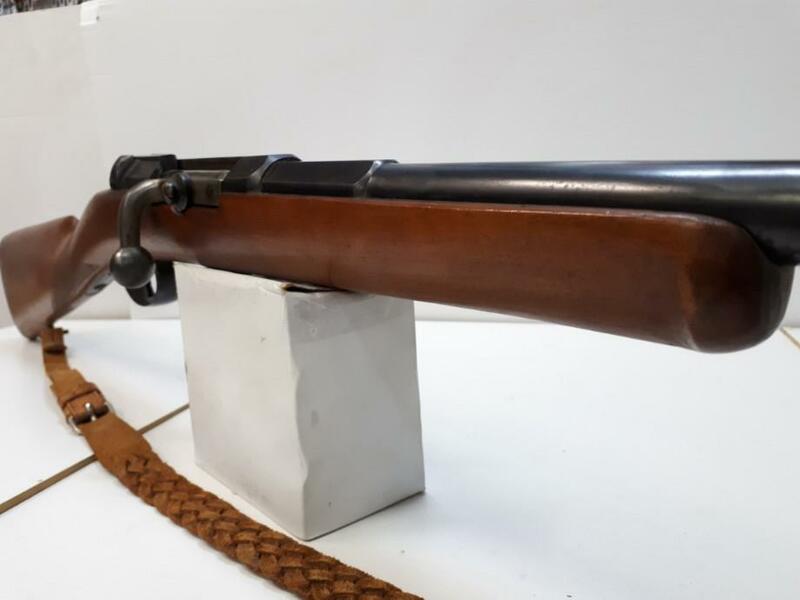 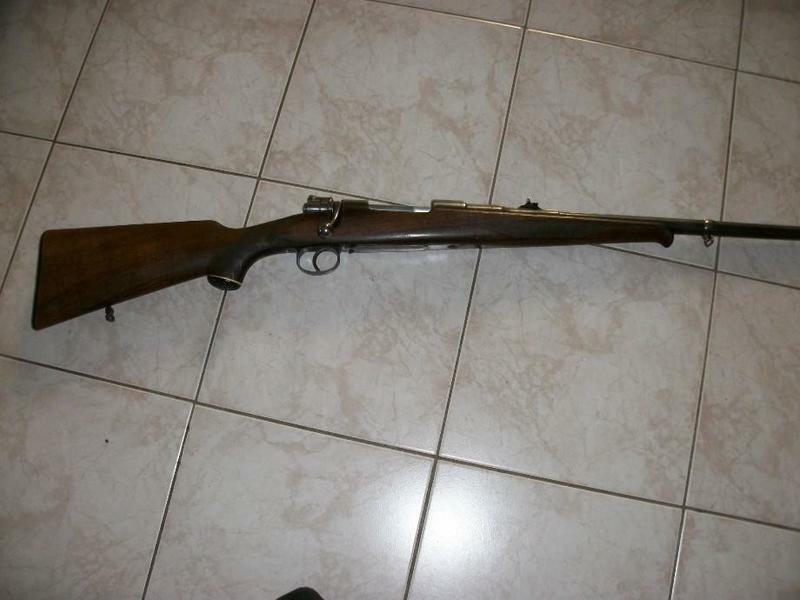 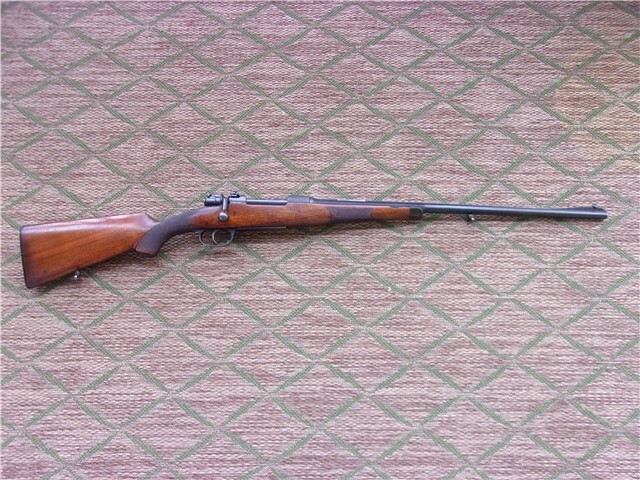 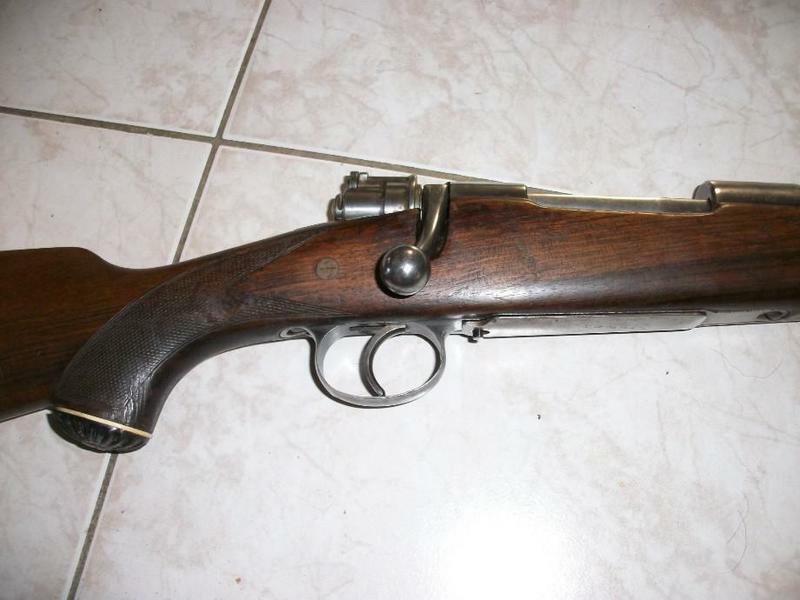 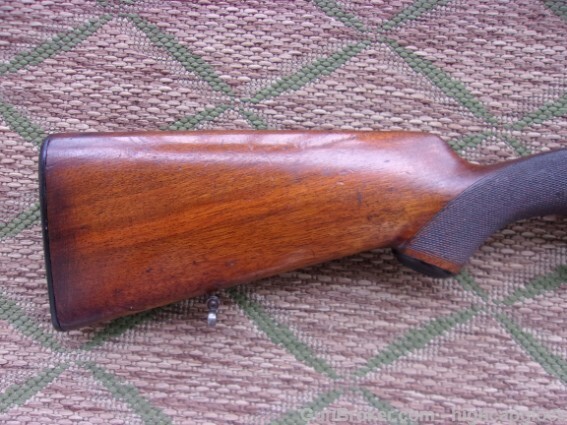 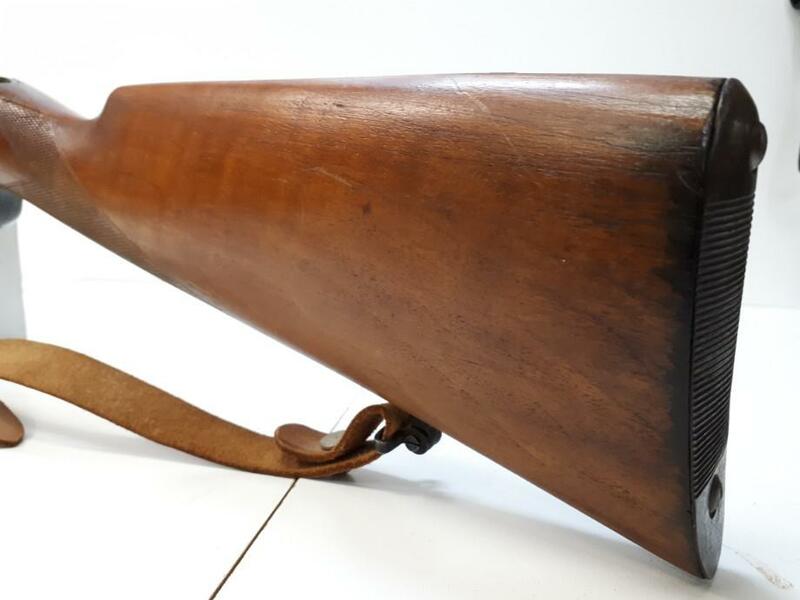 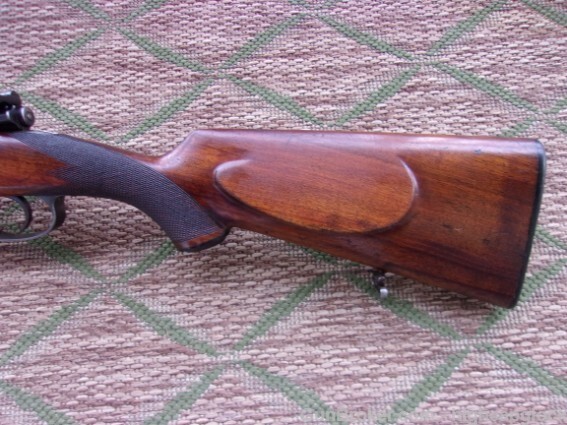 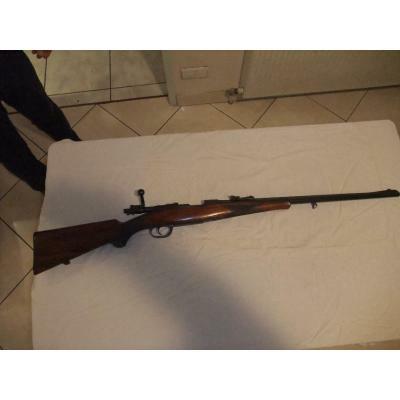 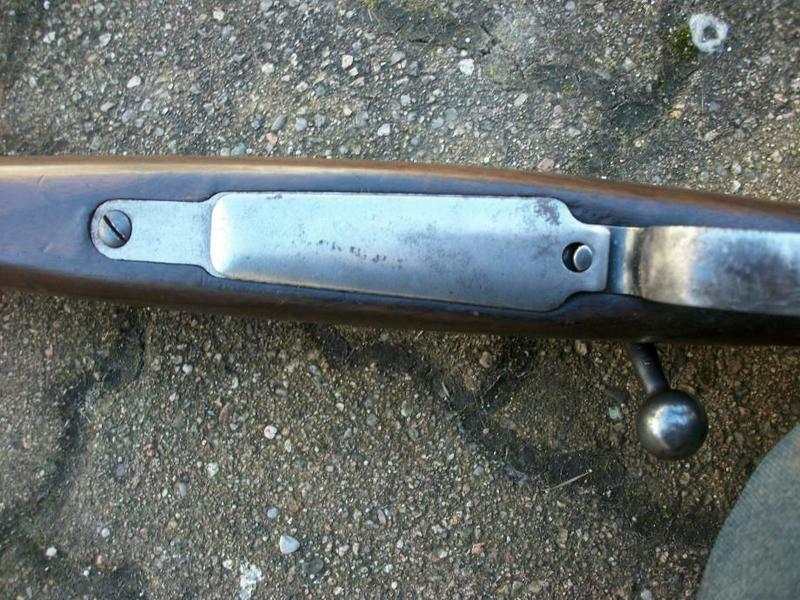 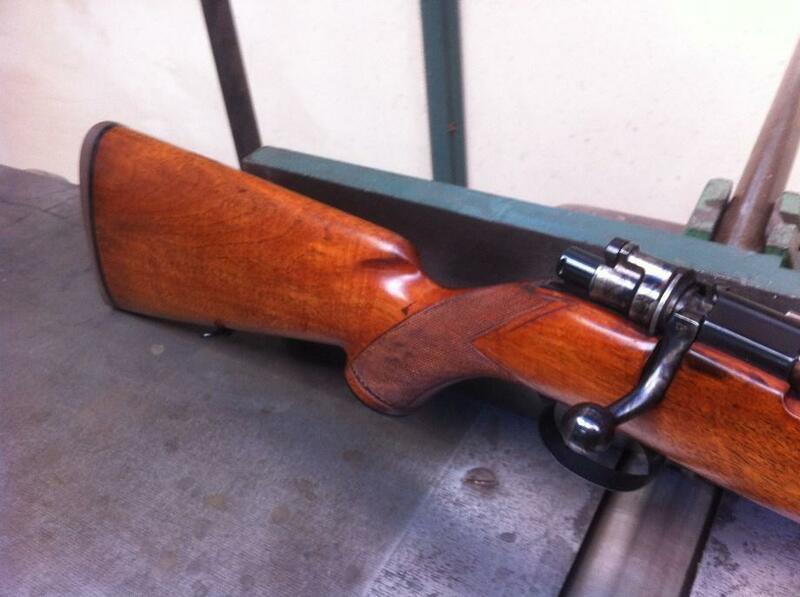 There was another Oberndorf Mauser I liked in the auction. 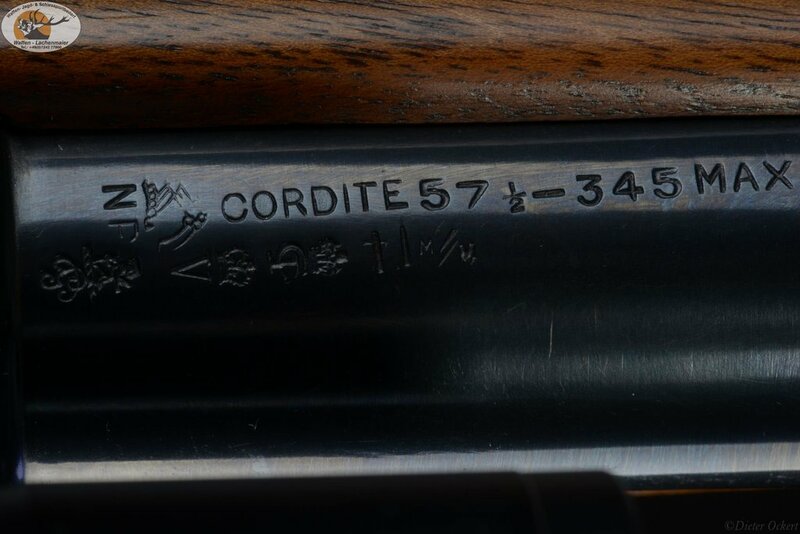 Lot #784. 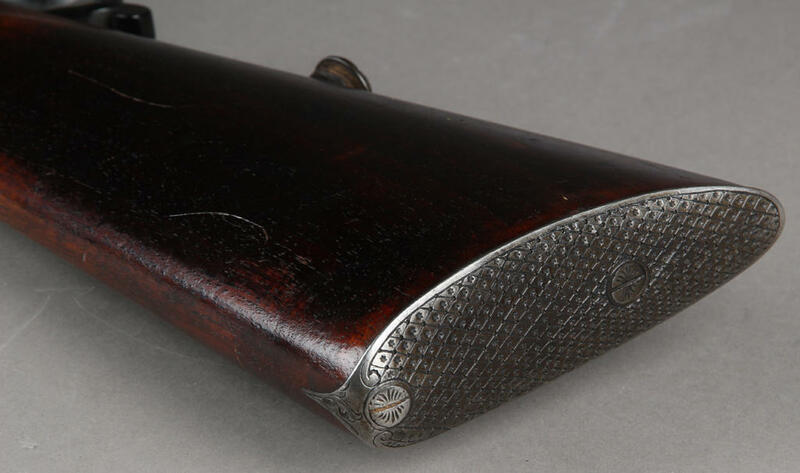 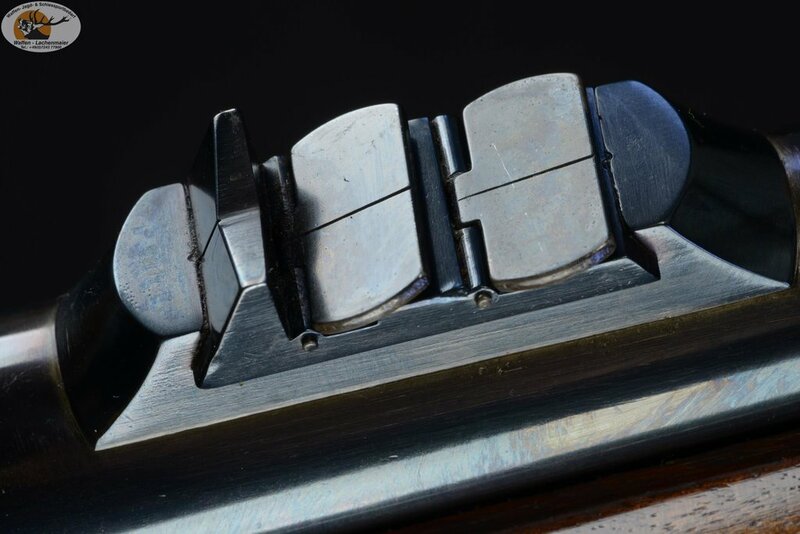 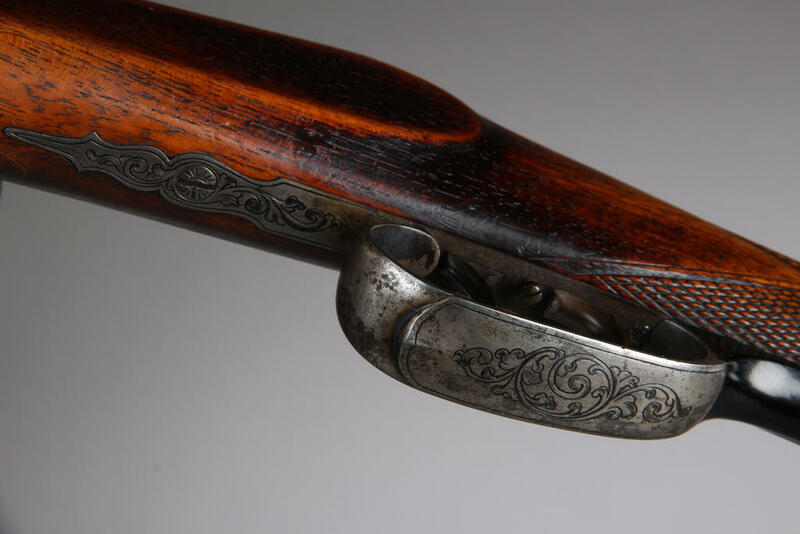 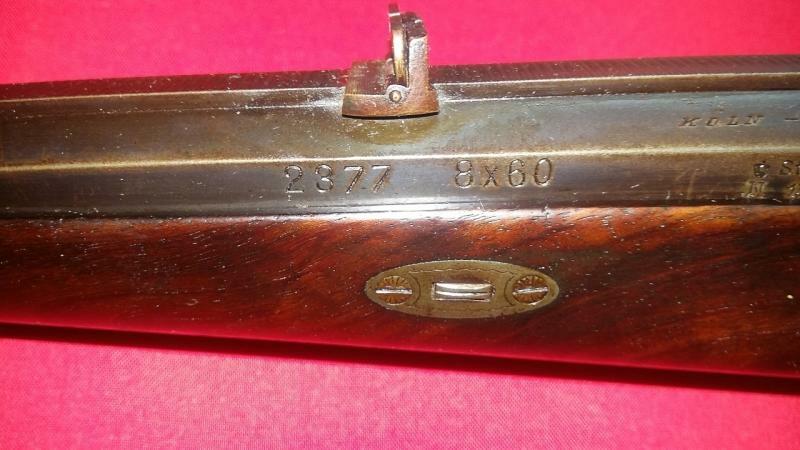 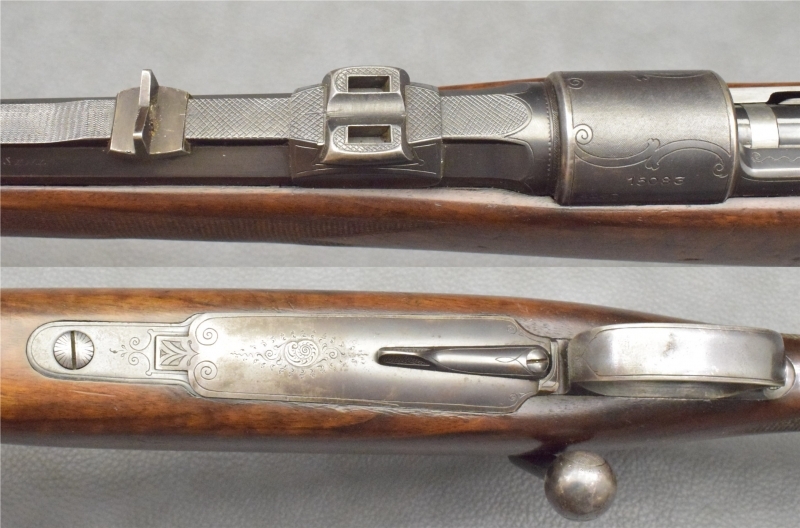 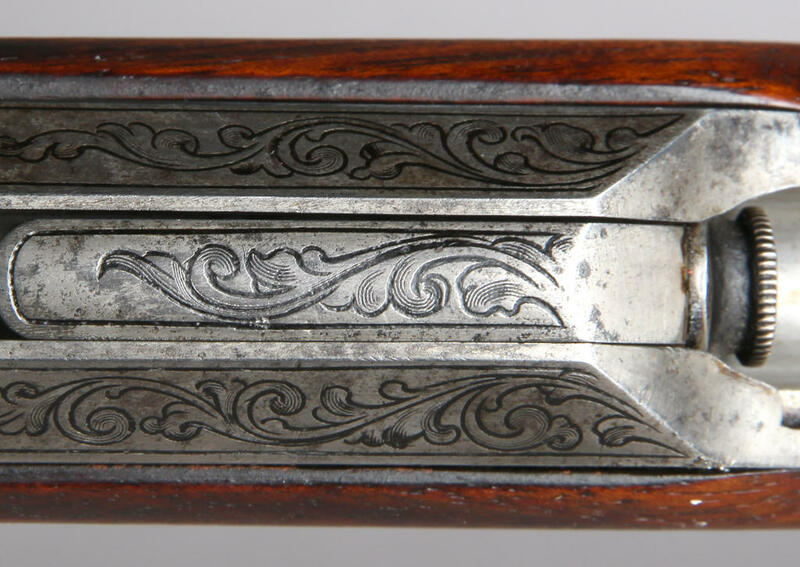 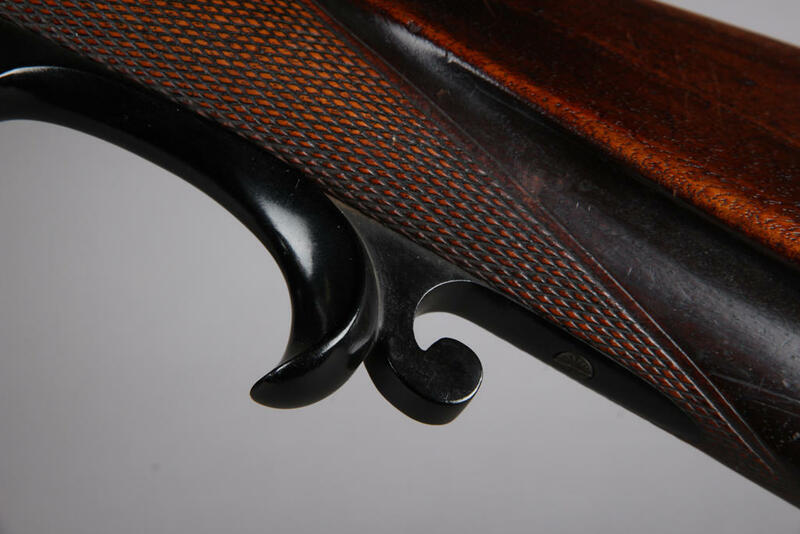 A late 8x57 TypeB, double square bridge, sold with another unusual Mauser with British proofs. 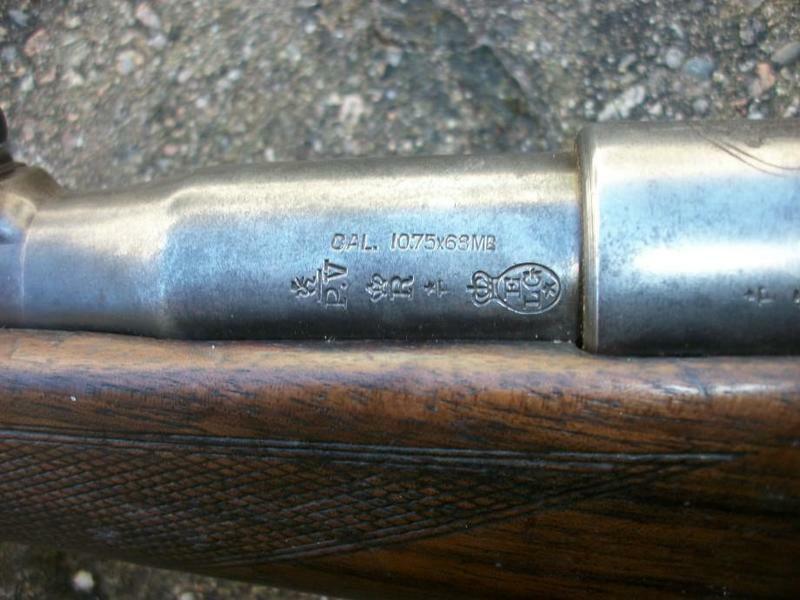 This is an interesting photo, as it shows a "Leichte Feldkanone C/73", 8 cm caliber. 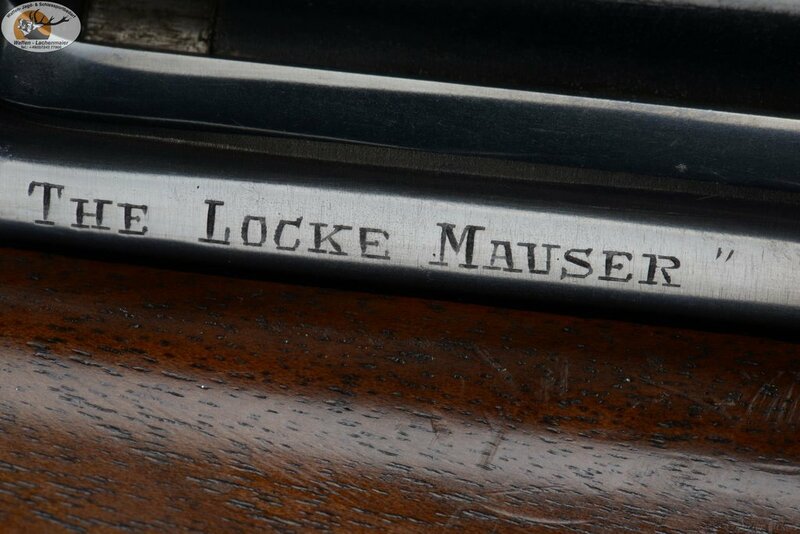 According to v.Lettow – Vorbeck's books, the German Schutztruppe had two of these outdated guns in 1914. 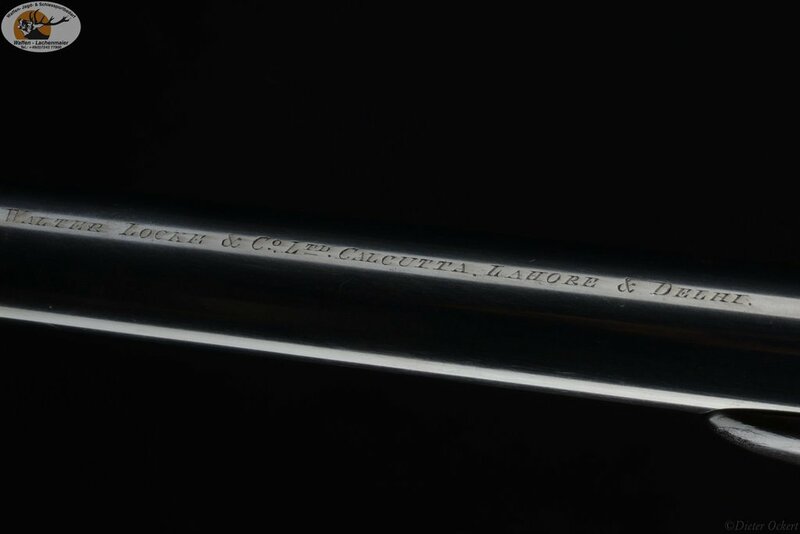 Since about 1900 the two guns had decorated the lawn in front of the government house in Daressalam. 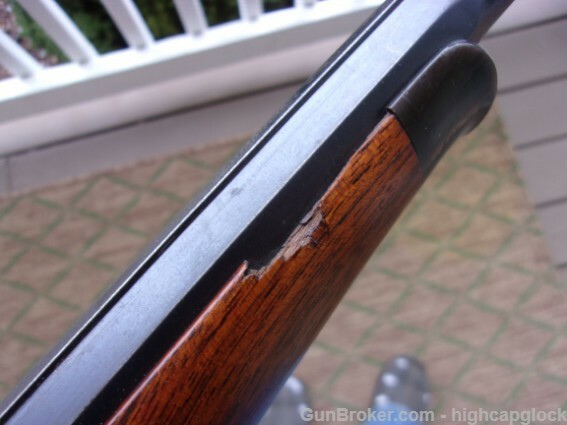 The empty shells were planted around the edge of that lawn, while the impact fuses were found in a dark warehouse corner. 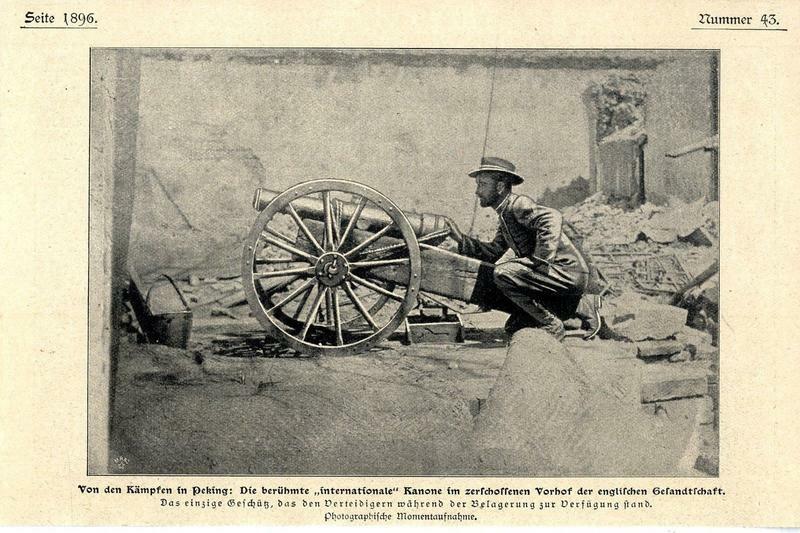 Lacking any artillery except some light mountain guns, the 2 old cannons were cleaned up and pressed into service. 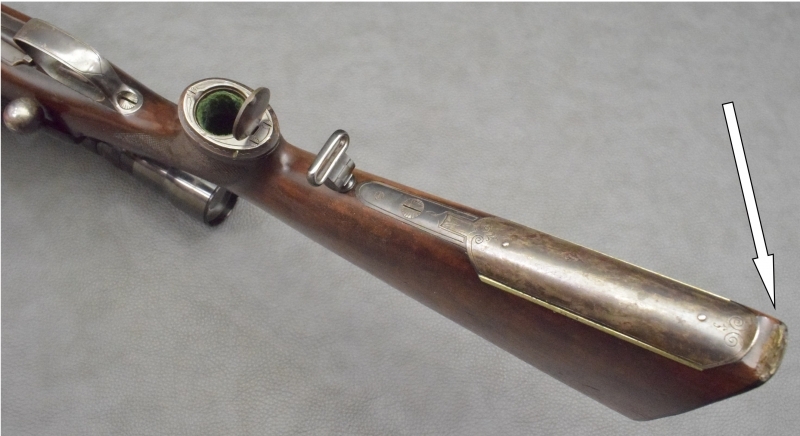 The shells were unearthed, wound with copper wire guide rings and refilled with blackpowder . 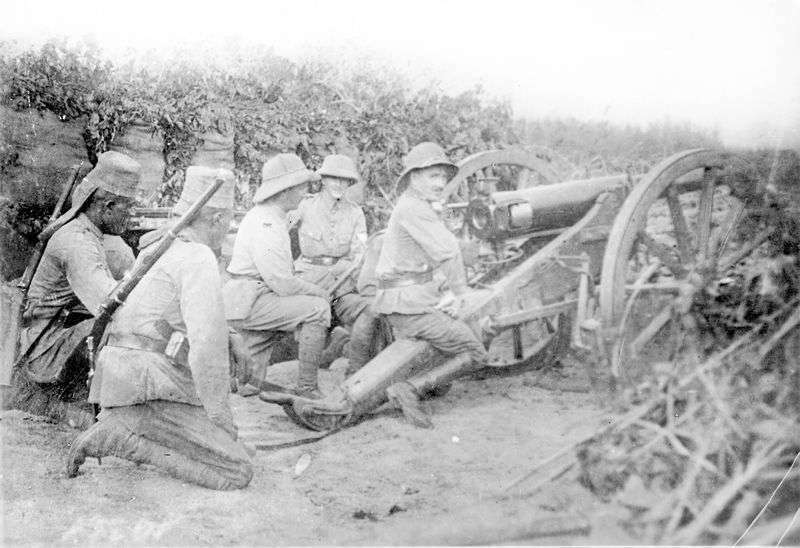 Both guns were used effectively in November 1914 to repel an abortive landing of about 8000 British – Indian troops near Tanga. 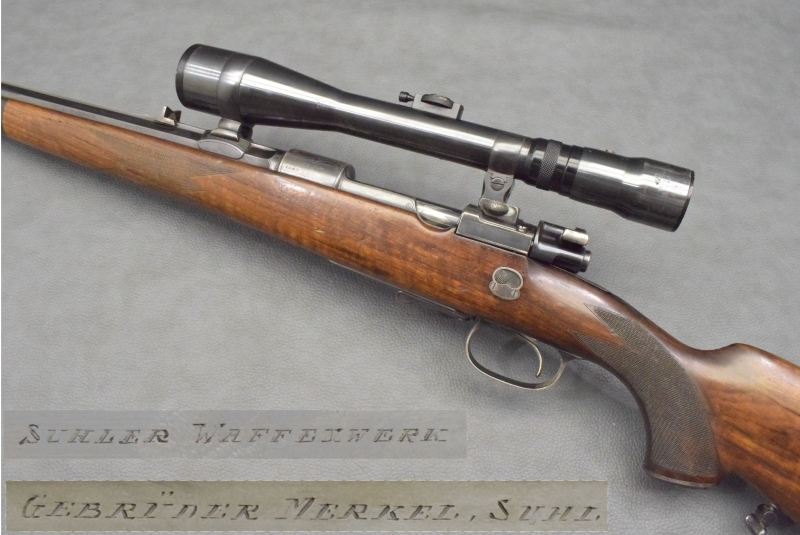 The outcome of this landing allowed the Schutztruppe to expand and resupply, as the British forces left behind enough modern Lee –Enfields to equip more than 3 companies, 16 machine guns, 600 000 cartridges and sundry other equipment. 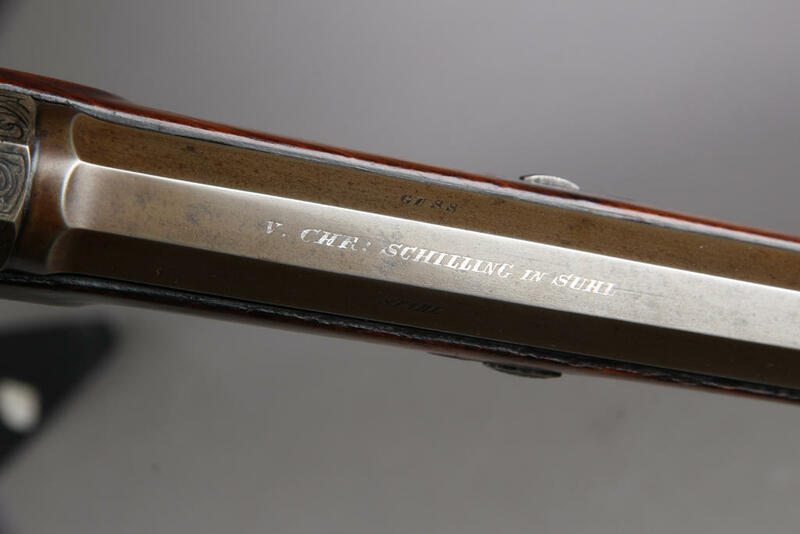 The Schutztruppe could field only about 1000 men against the numericallly superior empire forces, most of them freshly recruited Askaris. 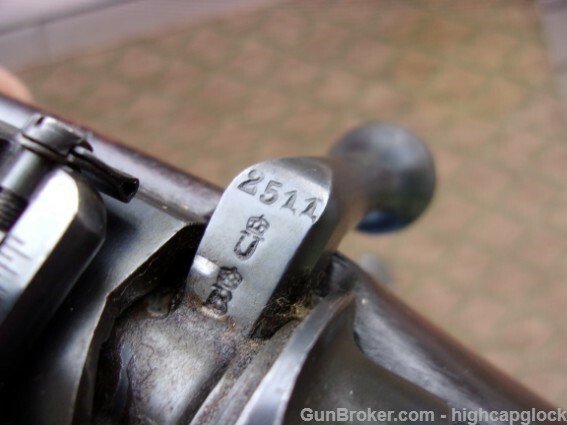 the only canon defender had during the siege"
such things happen, I know a muzzle loader canon with the barrel of a german 3,7cm flak canon that served for 40 years as a part of an iron fence. 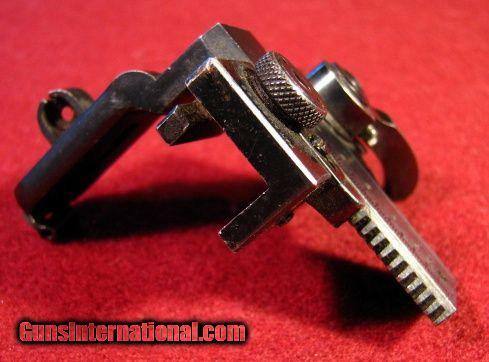 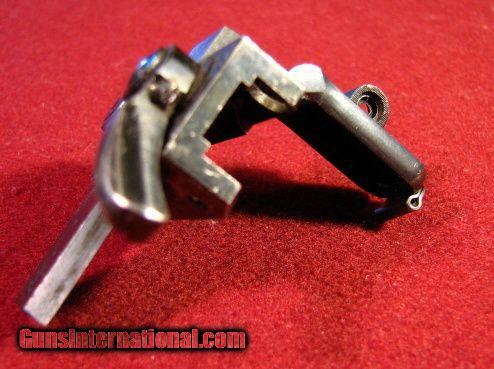 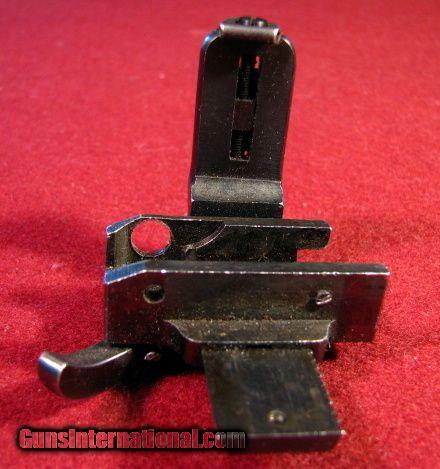 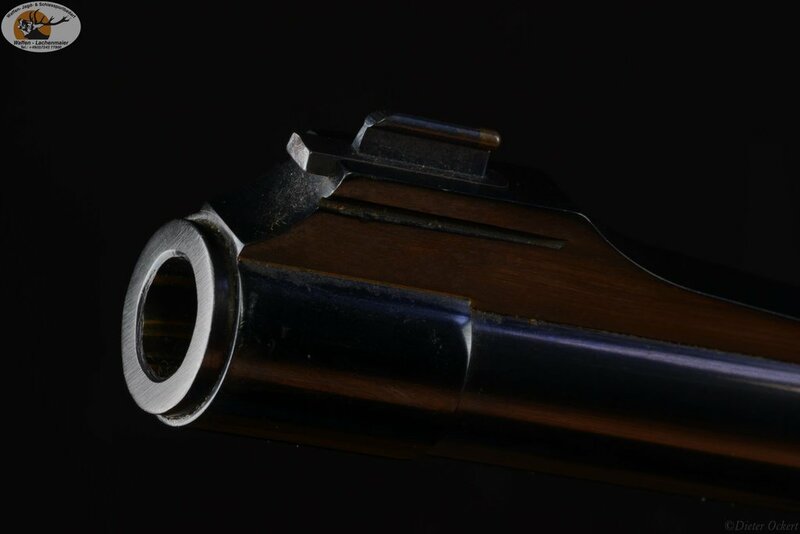 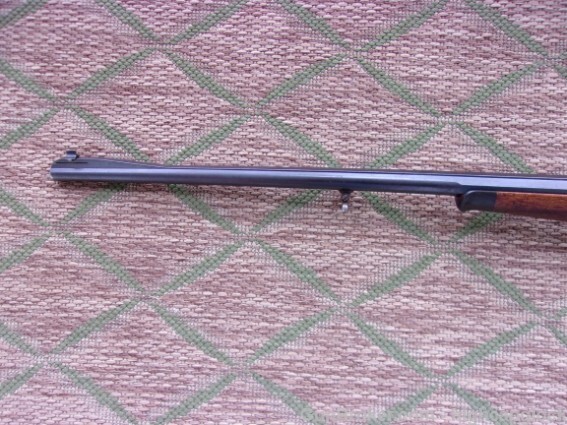 The rear tangent sight is of ES 340 B .22. lfB origin. 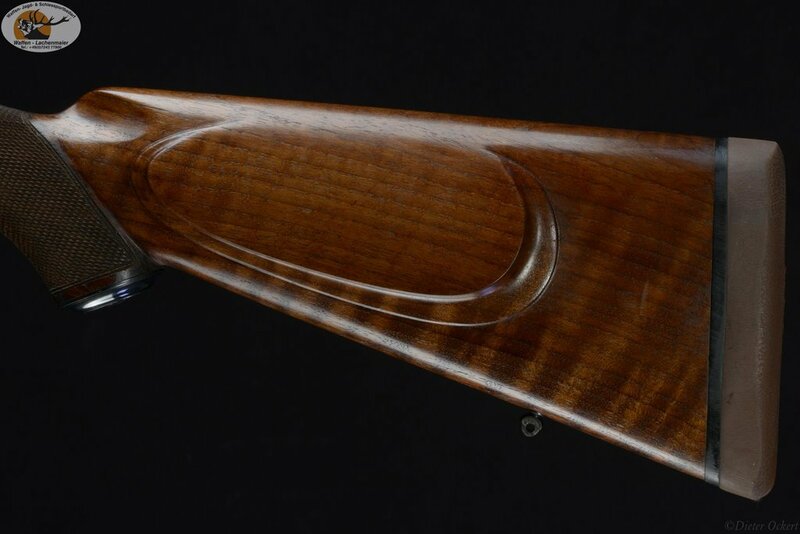 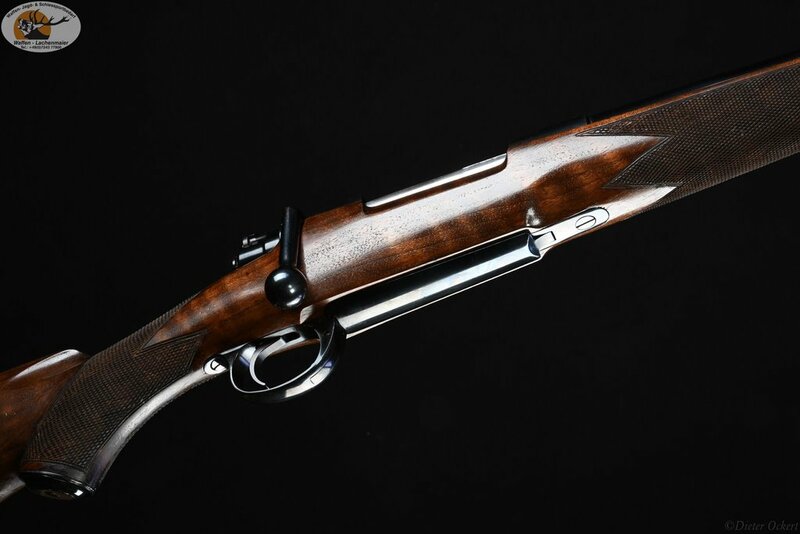 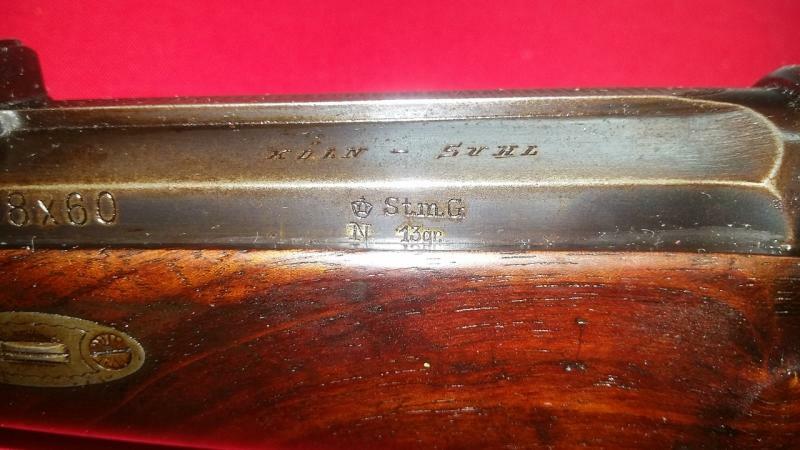 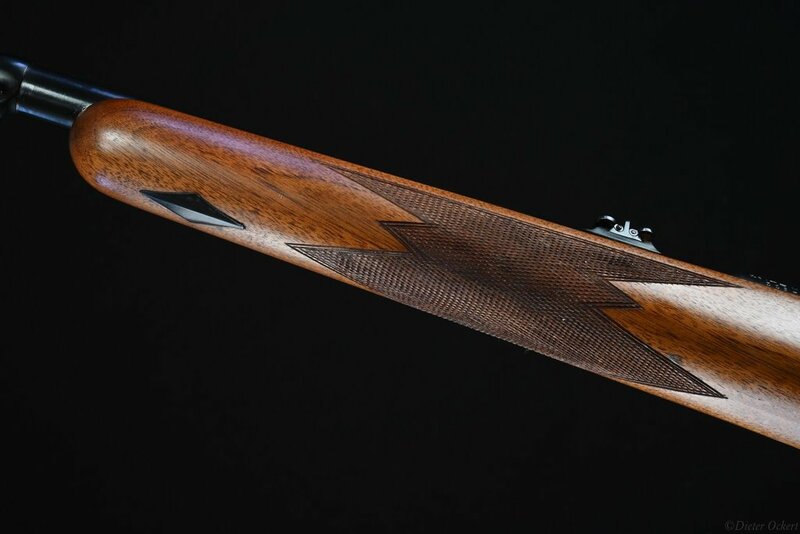 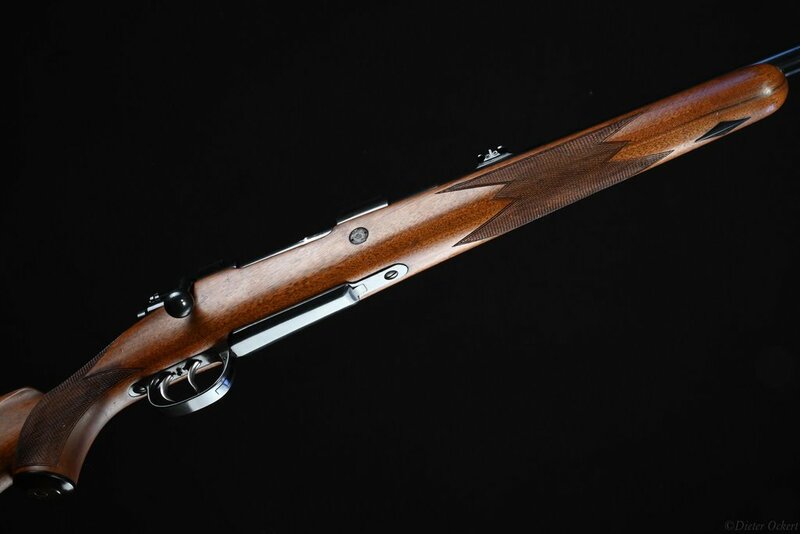 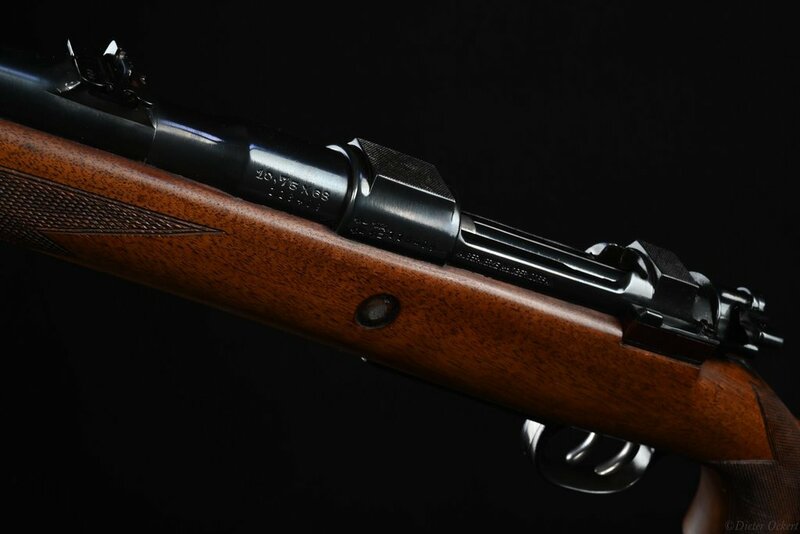 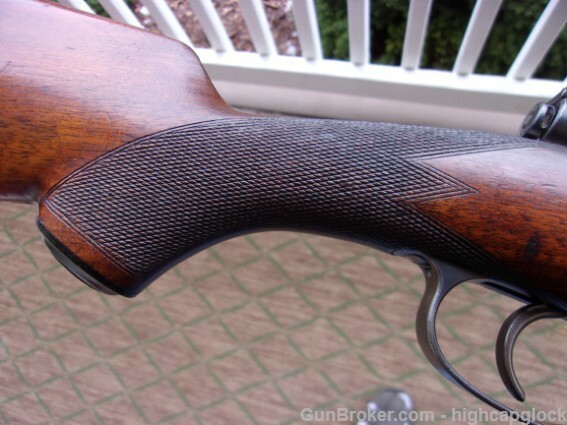 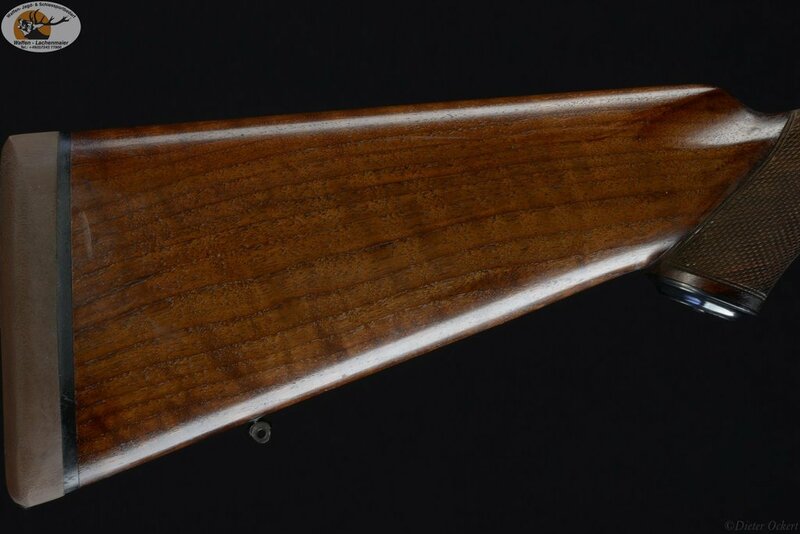 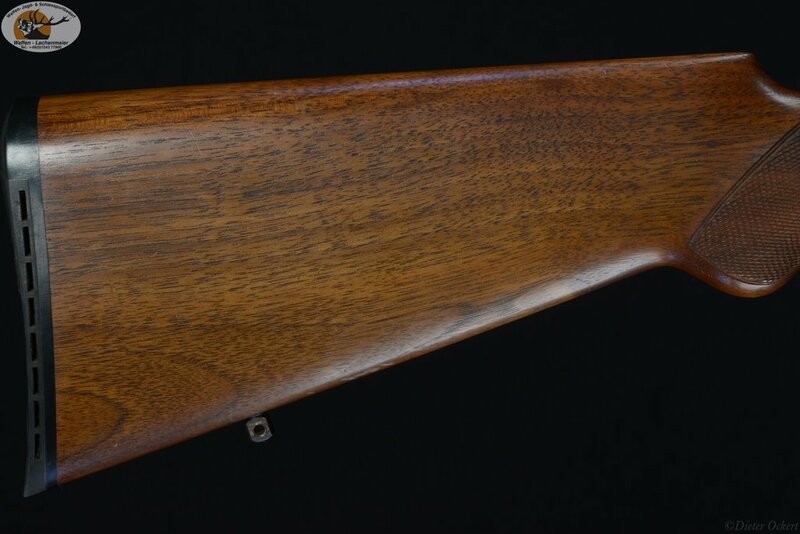 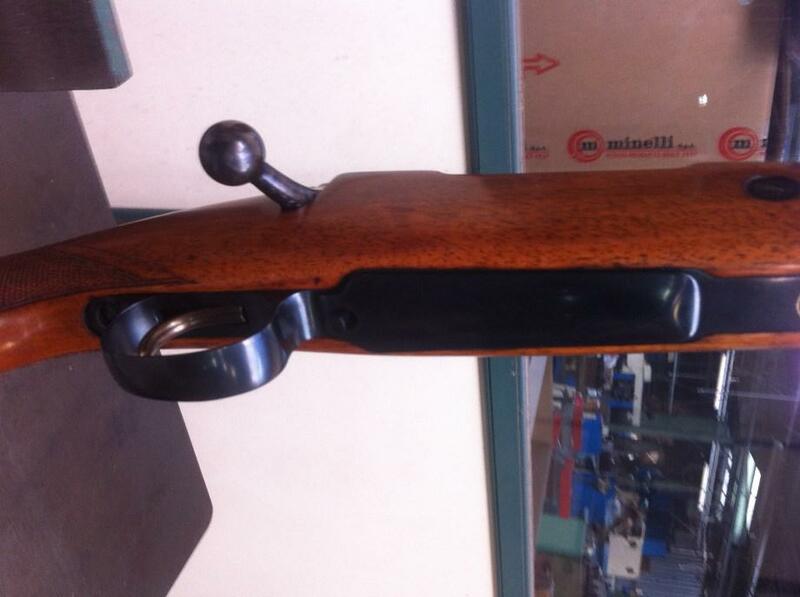 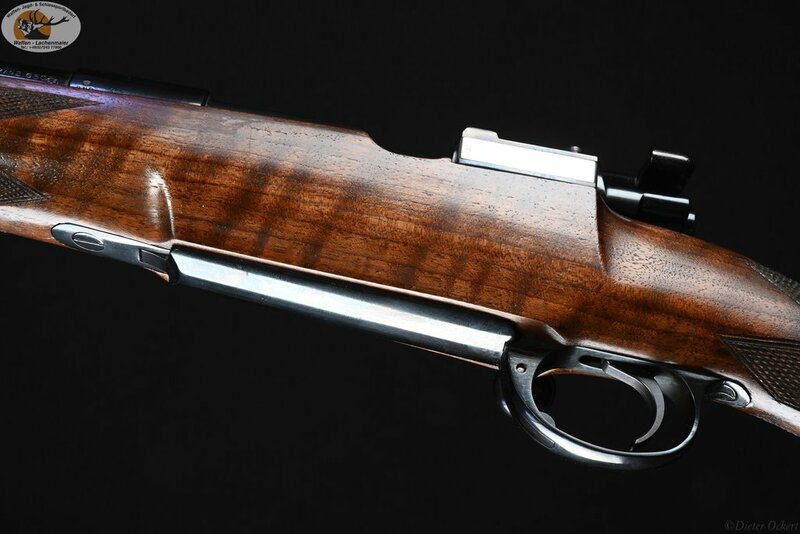 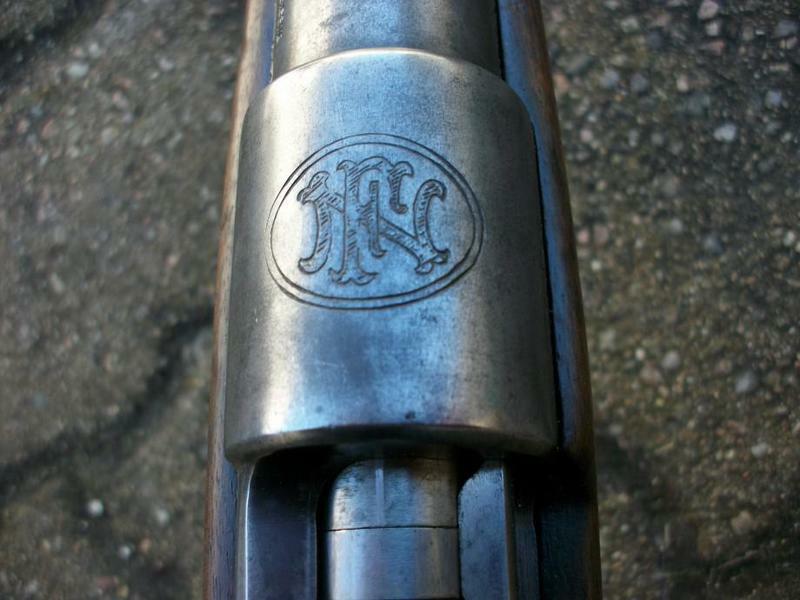 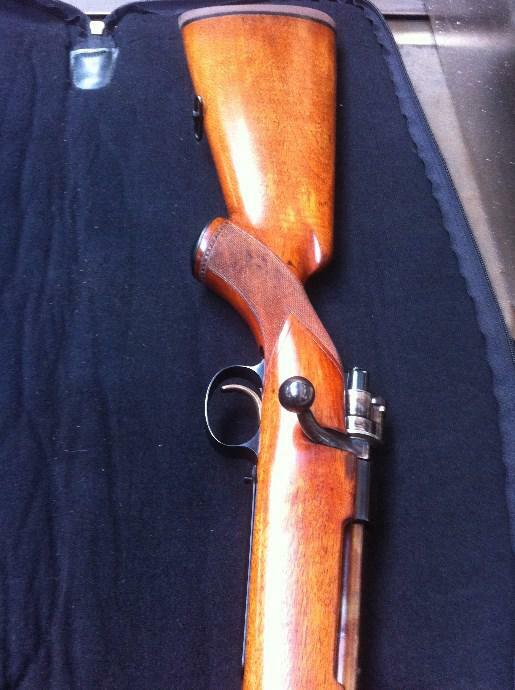 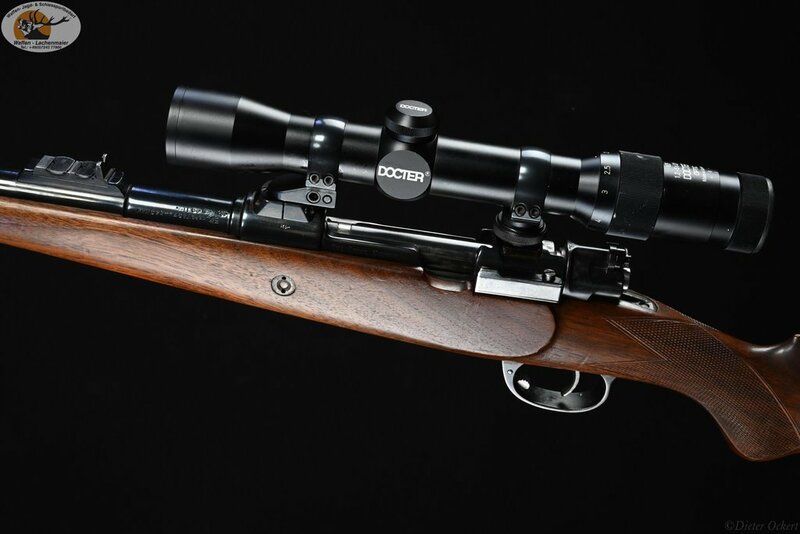 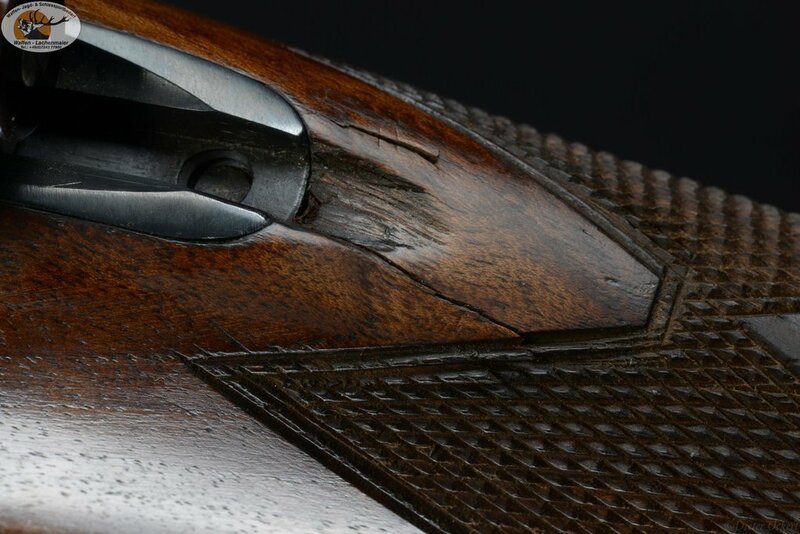 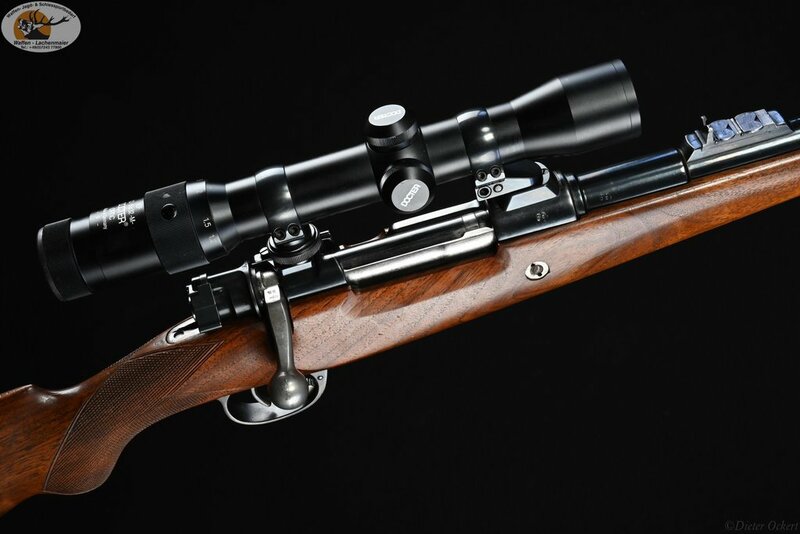 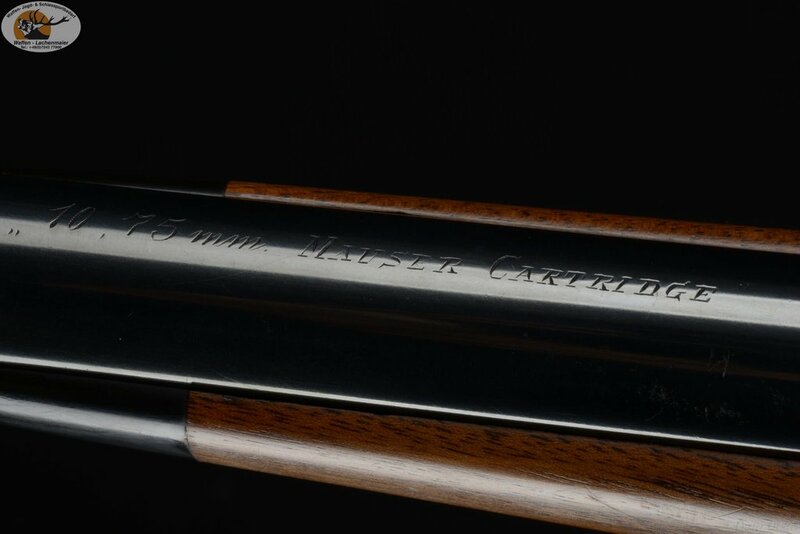 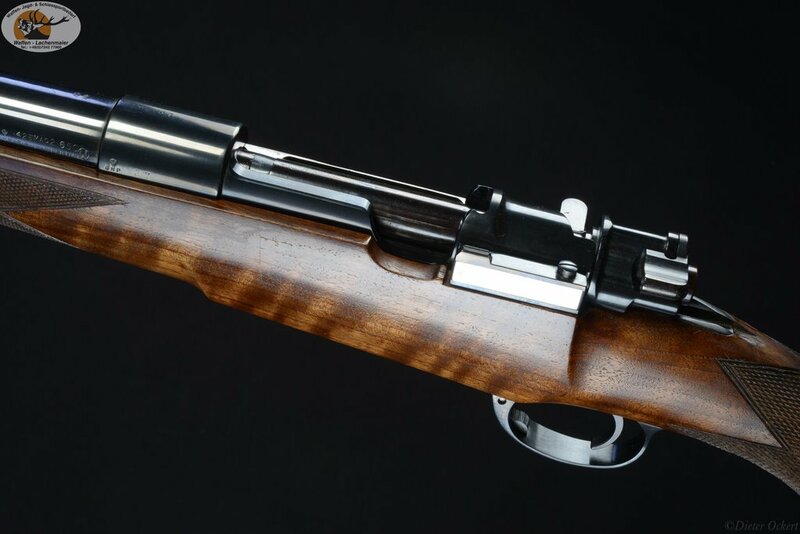 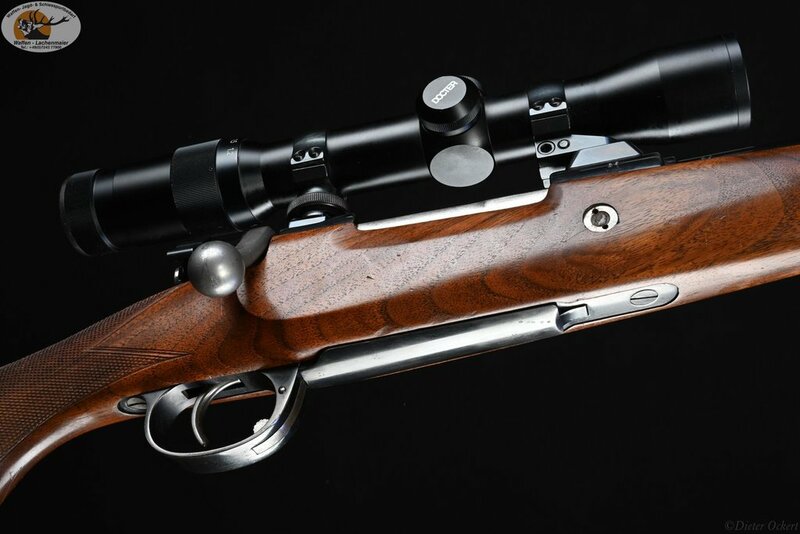 Very nice rifle, tastefully finished and engraved. 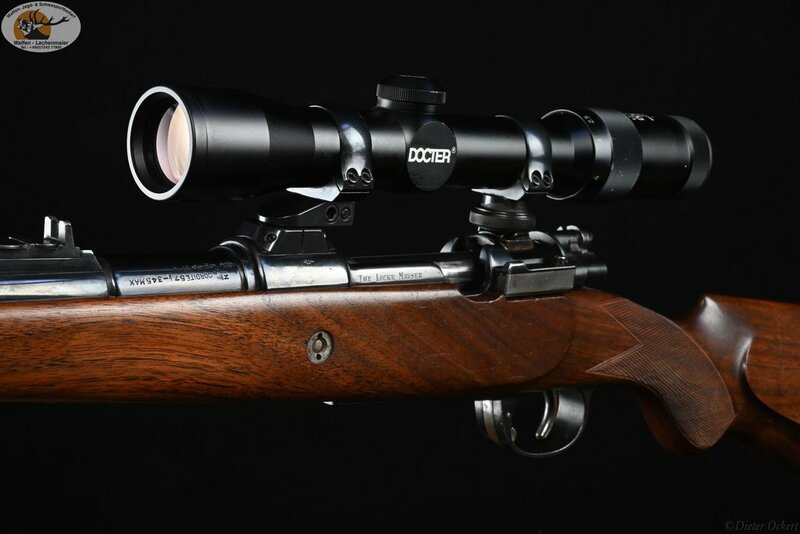 The scope looks good and suits the rifle very well. 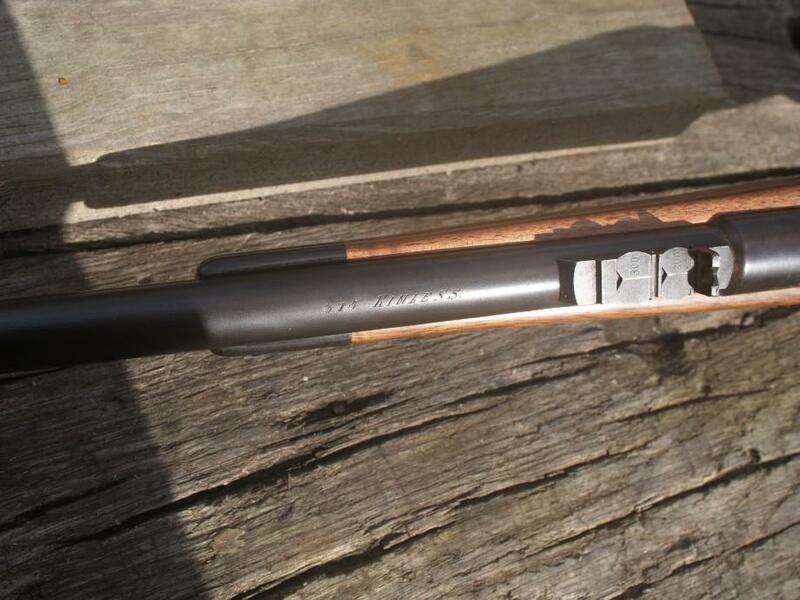 xausa, that is a nice one! 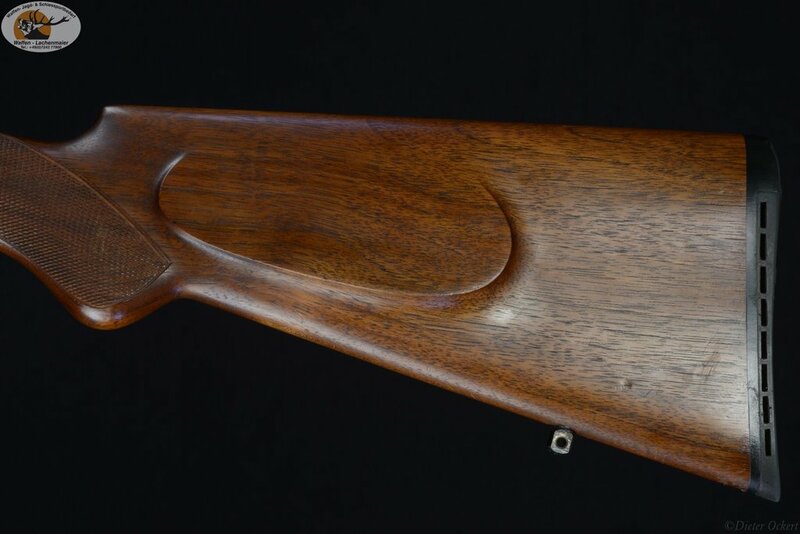 Can't wait to see how it shoots. 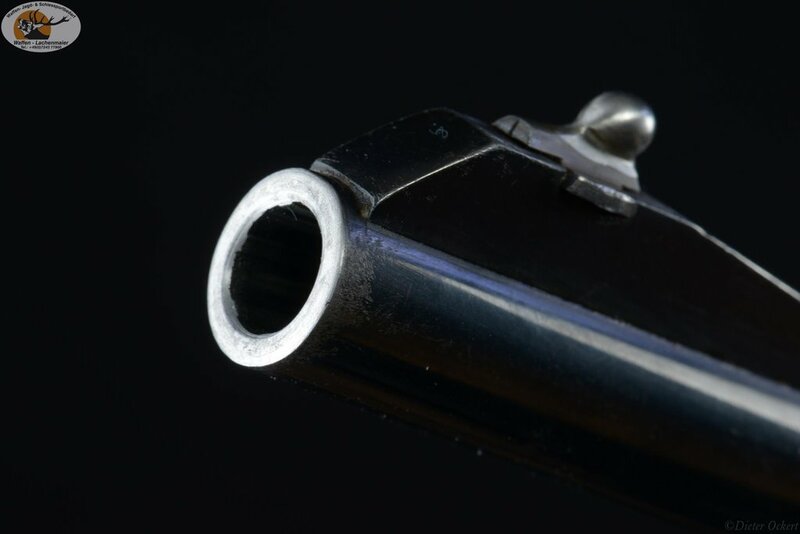 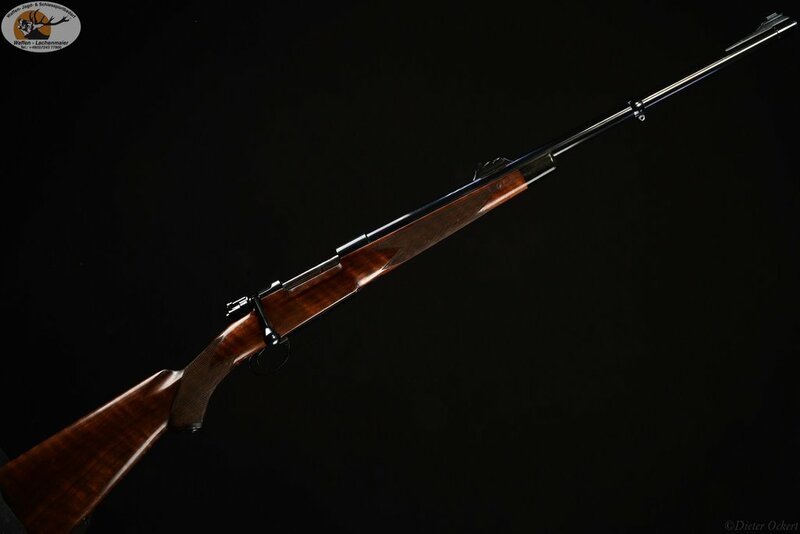 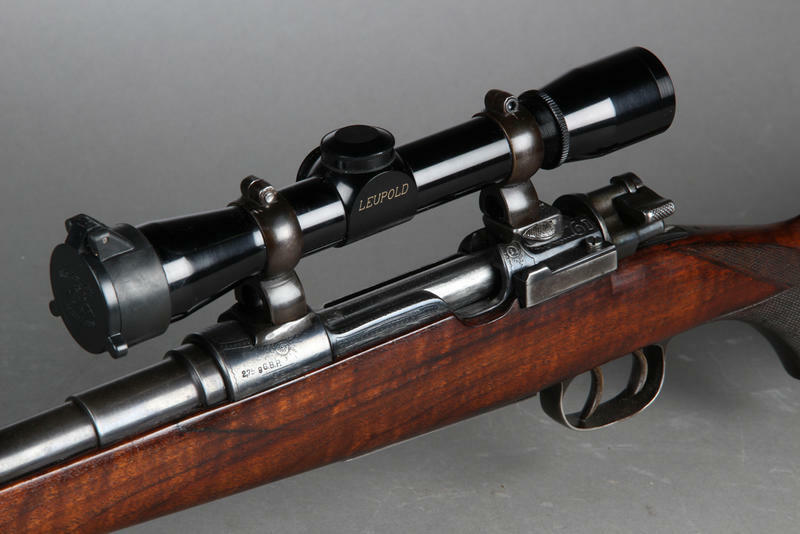 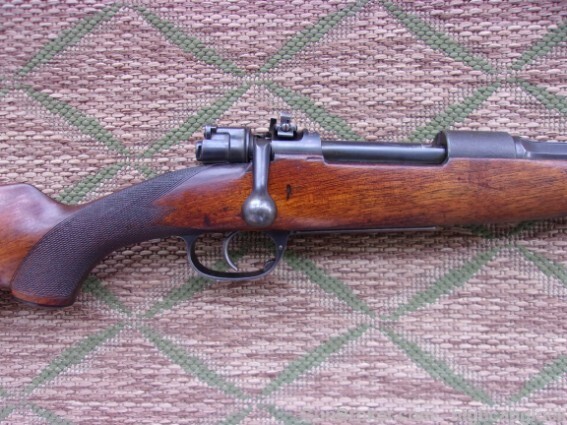 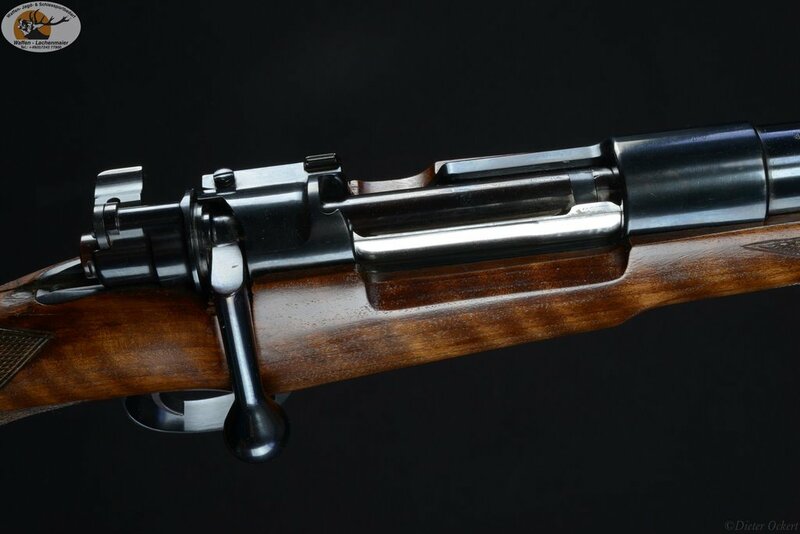 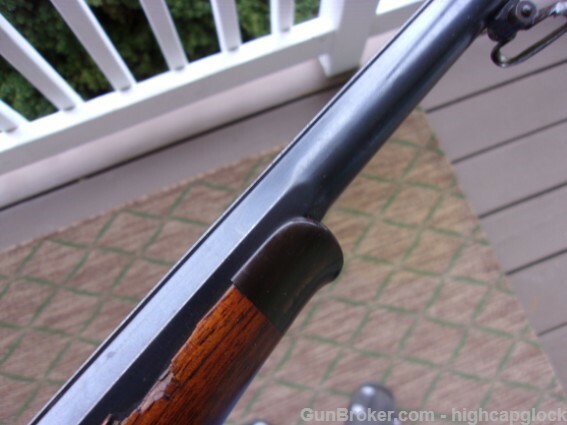 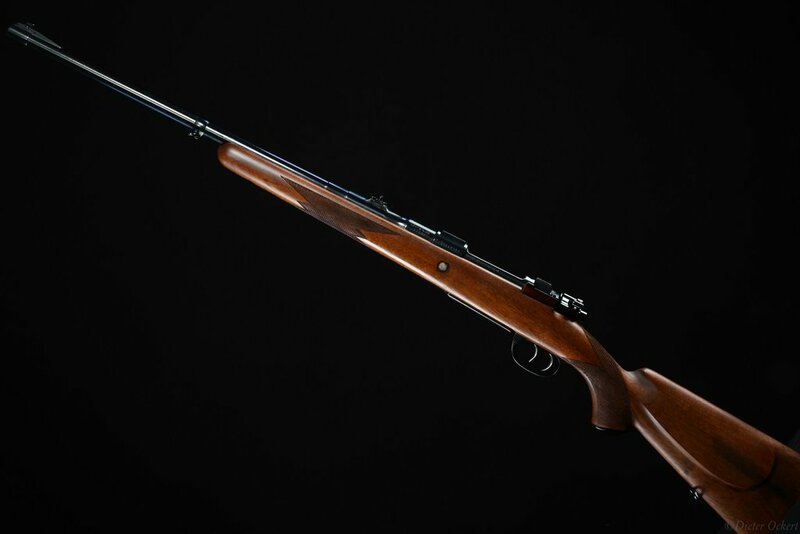 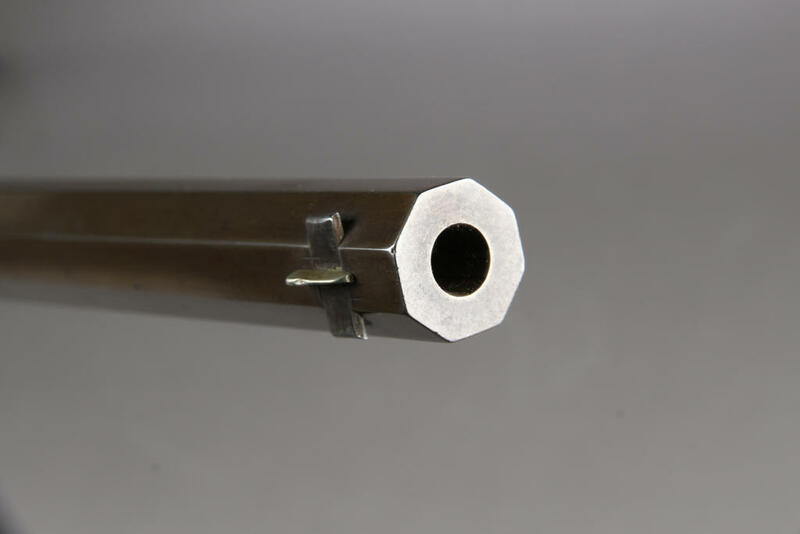 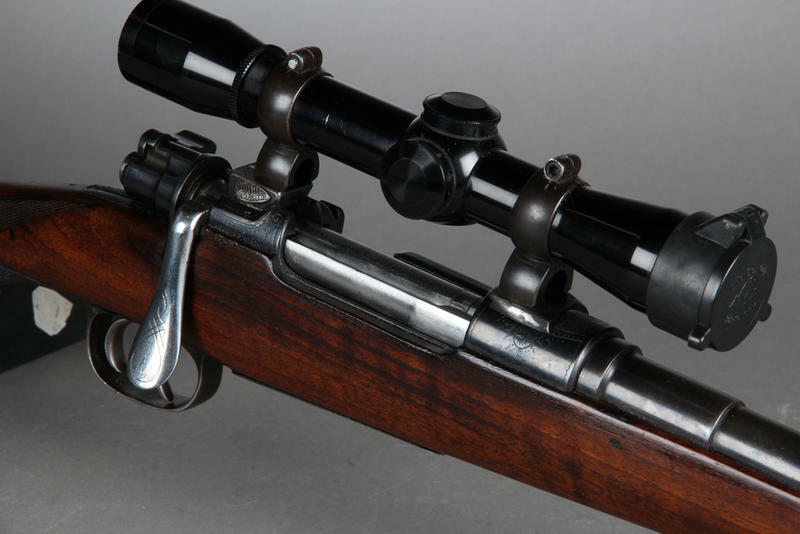 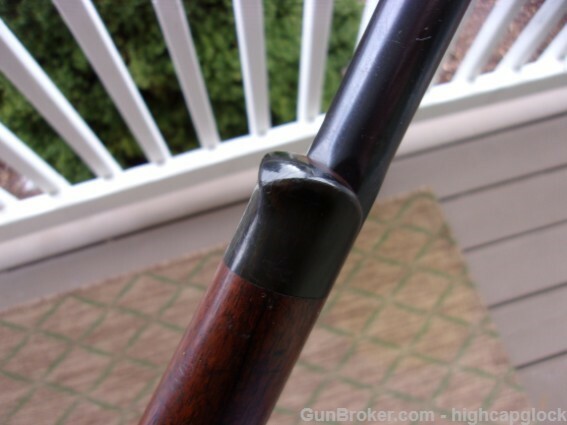 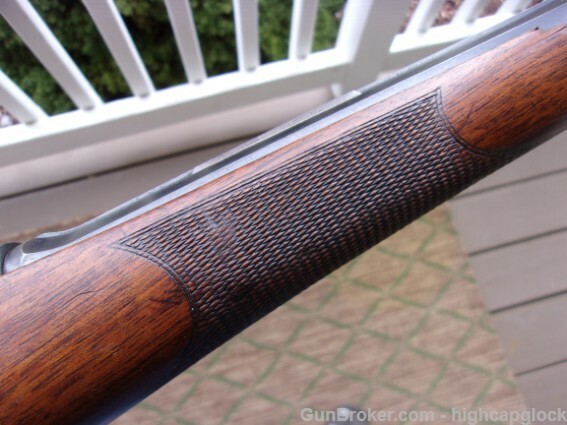 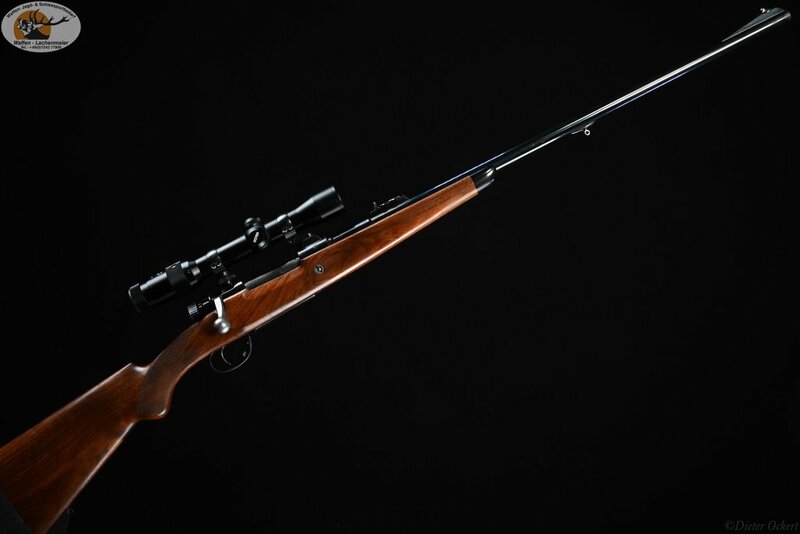 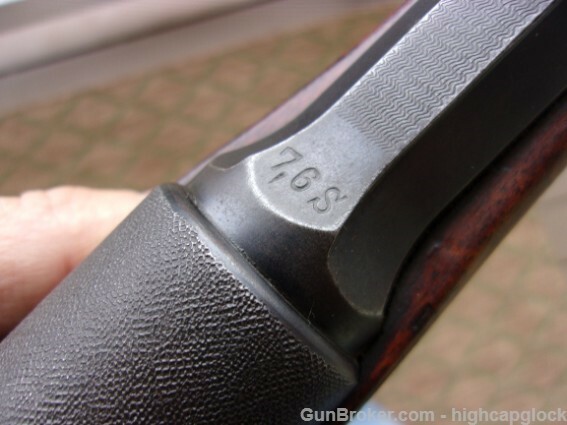 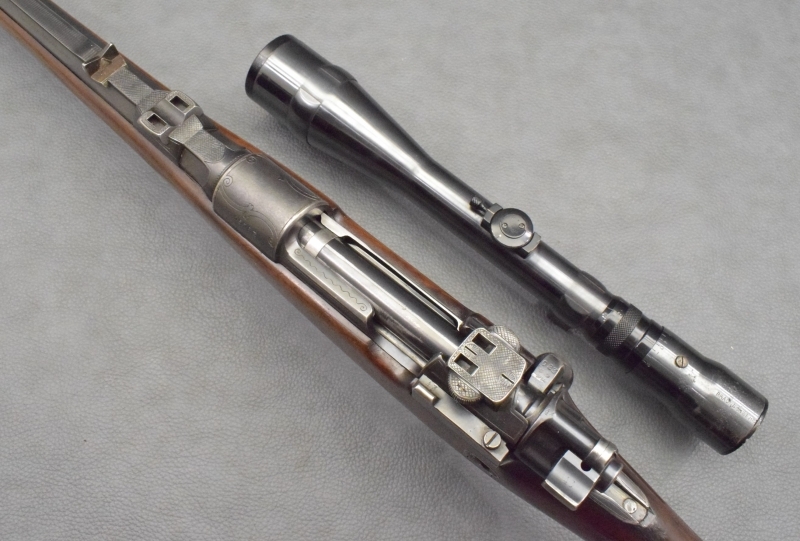 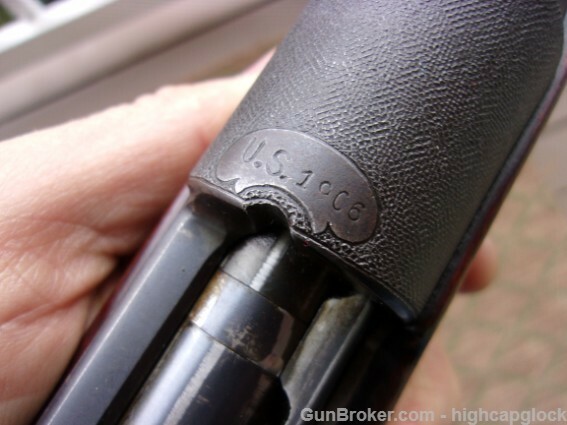 7x54 was the most common caliber among these "civilized" Arisaka rifles. 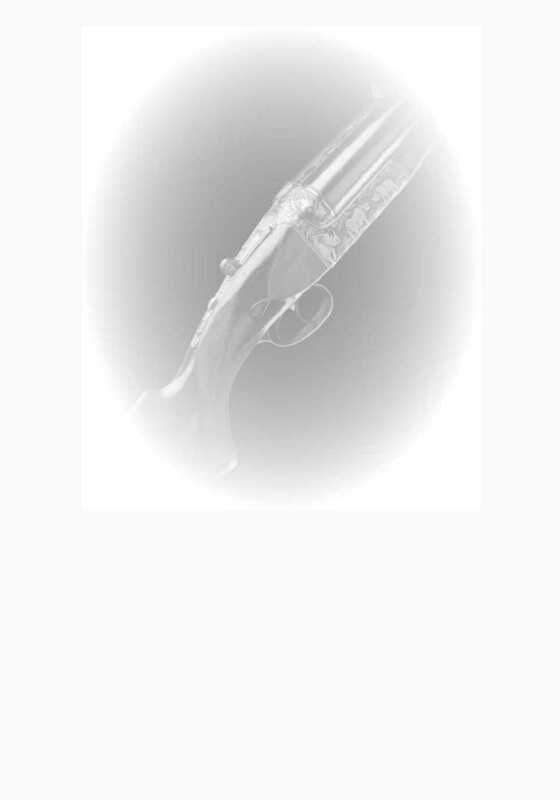 Most of them were made for light bullets i.e. 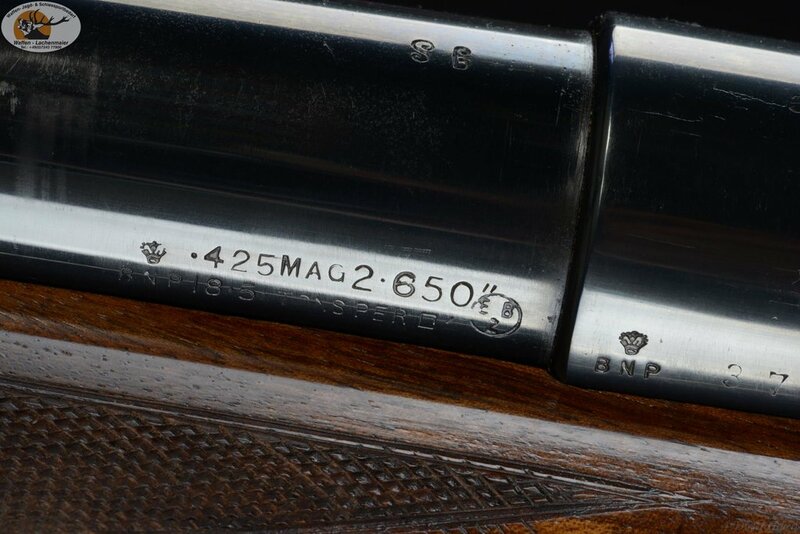 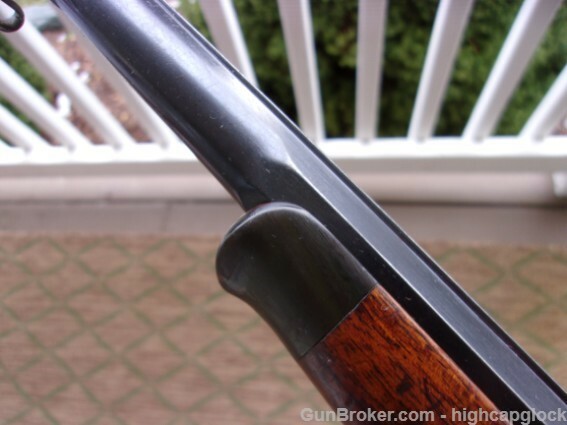 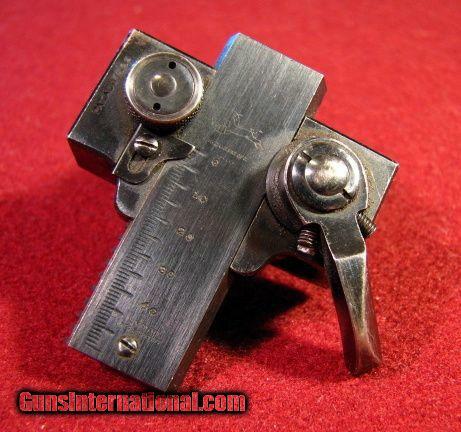 maximum bullet weight appr. 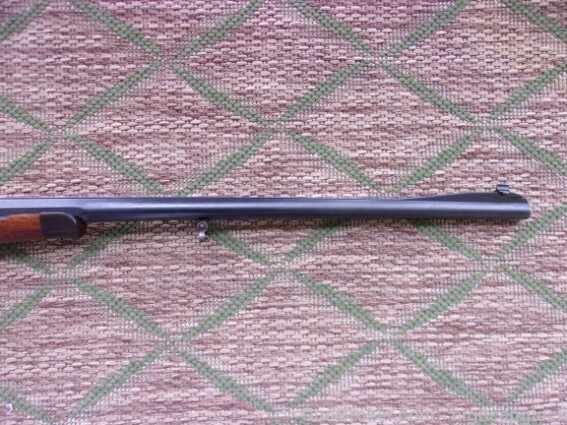 154 gr.